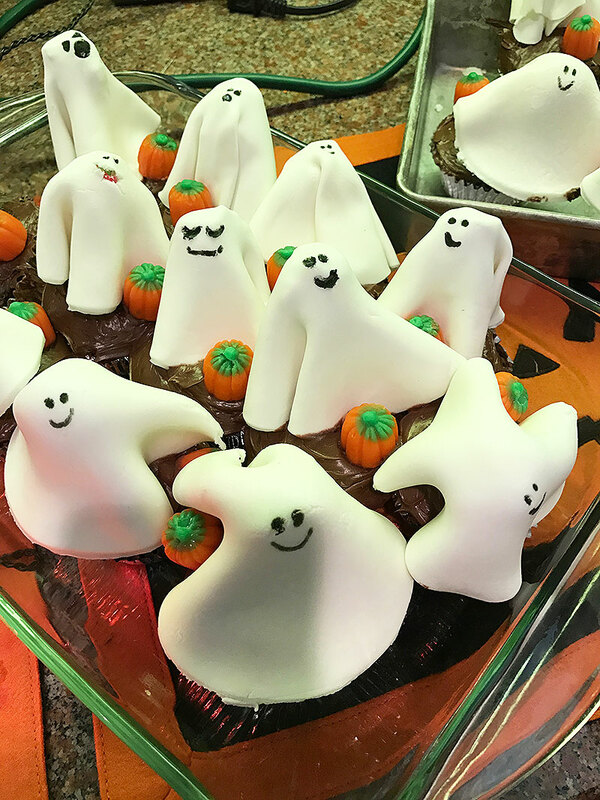 Simple and Adorable HALLOWEEN Goodies For Your Next Halloween Party! 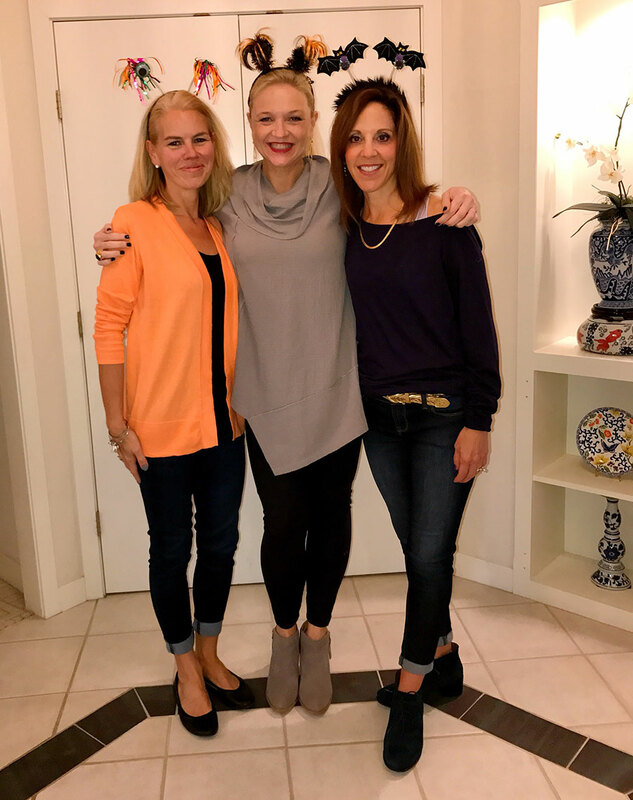 Two of the moms who made the party possible! As some of you may know, Halloween is my FAVORITE time of year. 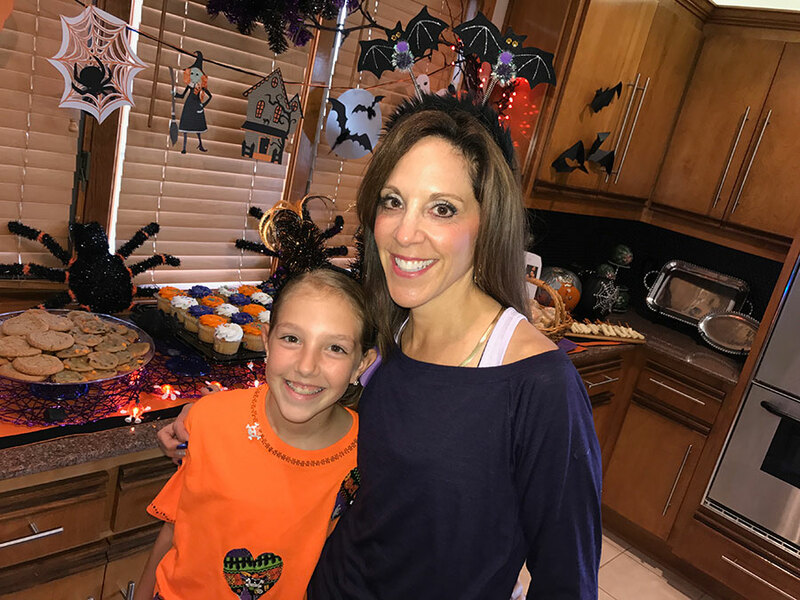 I love Christmas and Thanksgiving, but Halloween…. OH… it just gives me so many more opportunities to be creative! 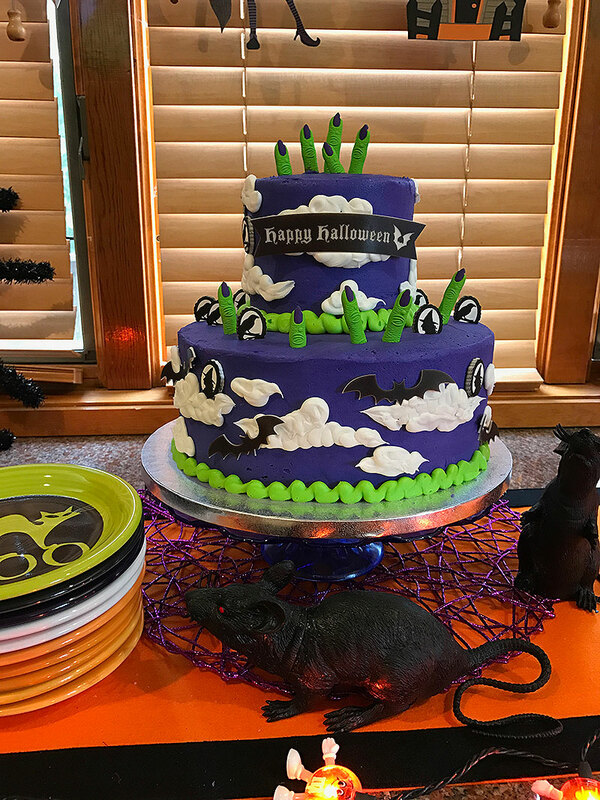 Plus, I also love seeing how creative other people can be and this is why I spend way more time than I should on Pinterest and Instagram looking for fun and innovative recipes for my Halloween parties. 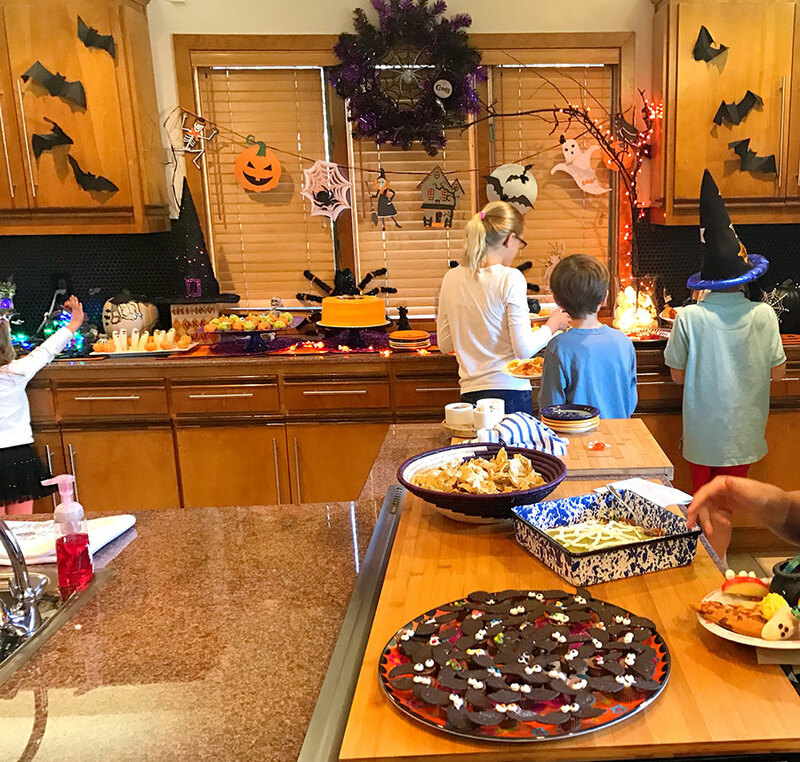 Each year, I throw a Halloween bash (or what I like to call a Halloween Taste Testing) every Friday for the entire month of October. I invite my friends, my sons’ friends and their parents, and anyone who wants to come! 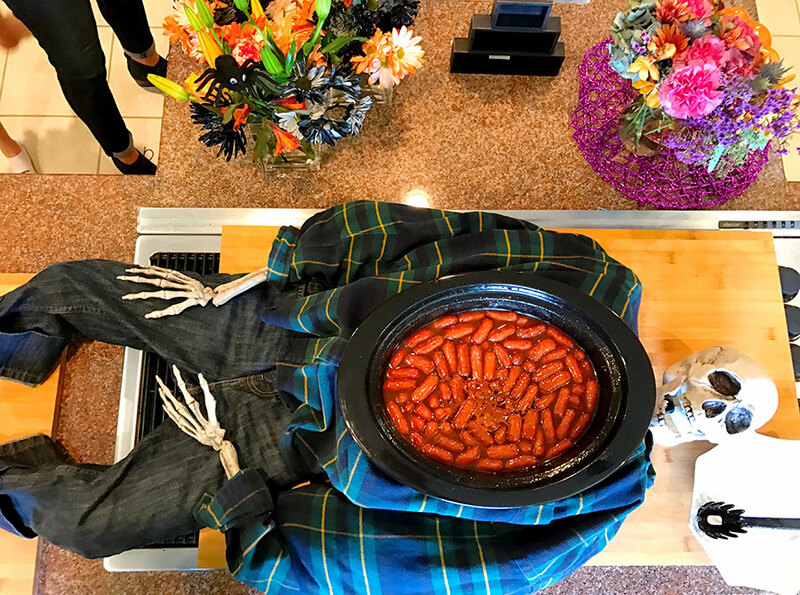 I ask everyone to bring a Halloween dish they love and we set it out on the buffet. Then, we all try what was created and talk about our favorites. 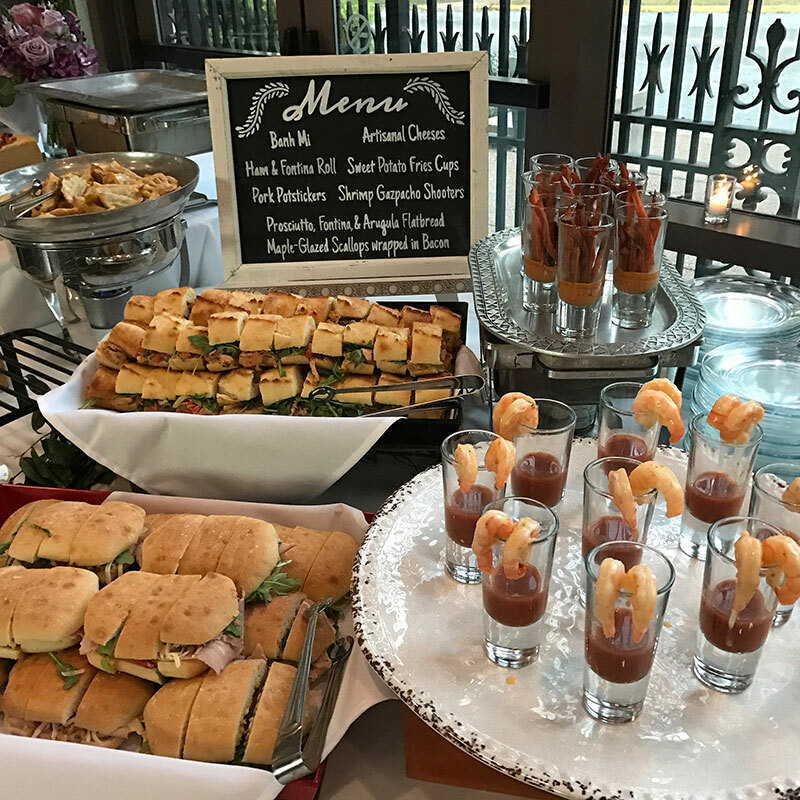 The below goodies were created by the many parents who attended and were considered the favorites of the taste testing! Enjoy! 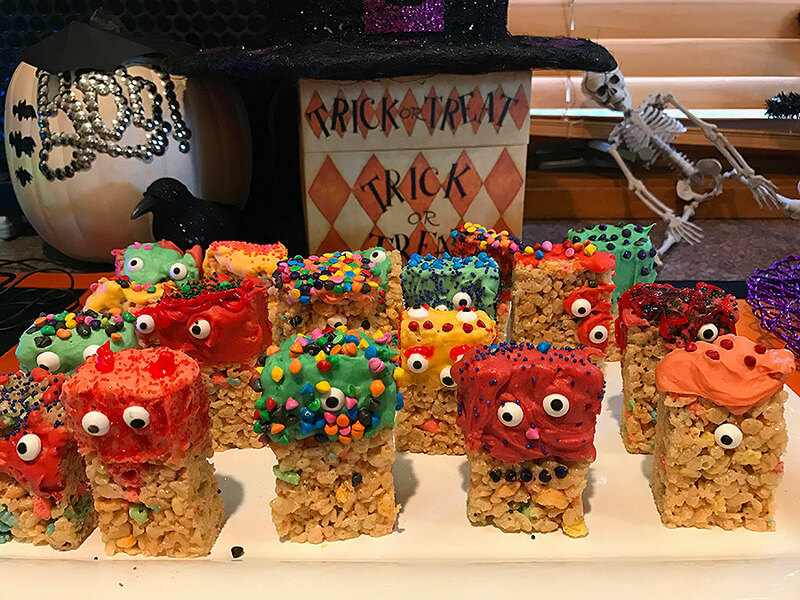 Delicious Rice Krispie Treat Monsters. The above Halloween Rice Krispie Treat Monsters are made just like any Rice Krispie treats. However, I also dipped the top portion in candy melts and my son decorated them with various sprinkles and candy eyes. They came out adorable. 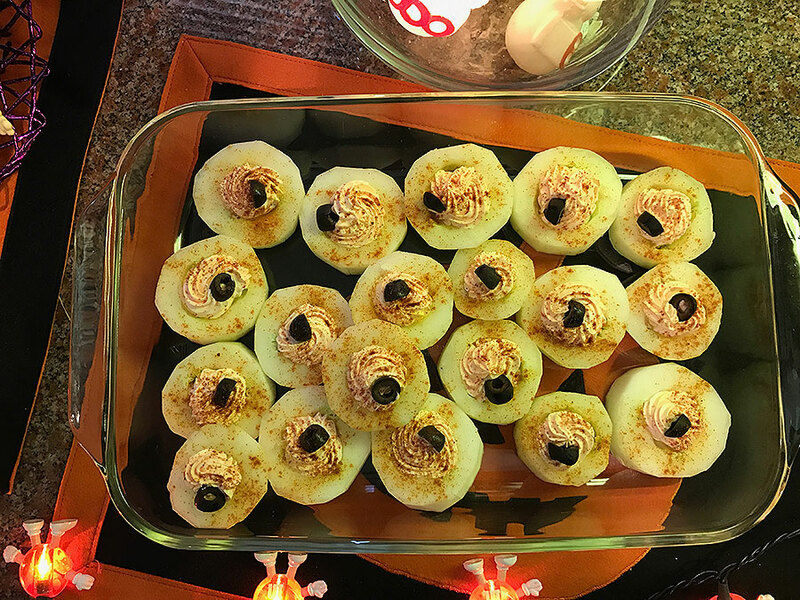 Yummy vegetable jack-o-lanterns filled with healthy vegetables. 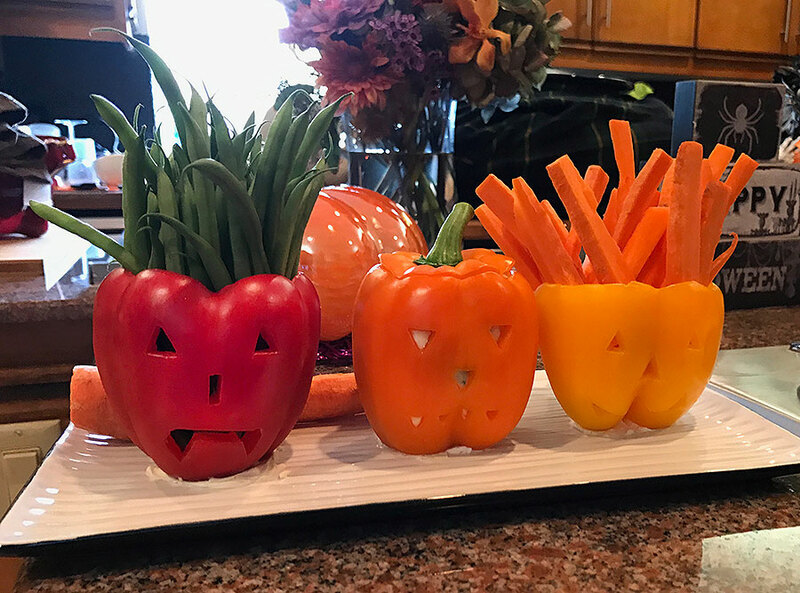 My friend Rhae brought these healthy jack-o-lantern pepper snacks. A wonderful and healthy addition to the table! 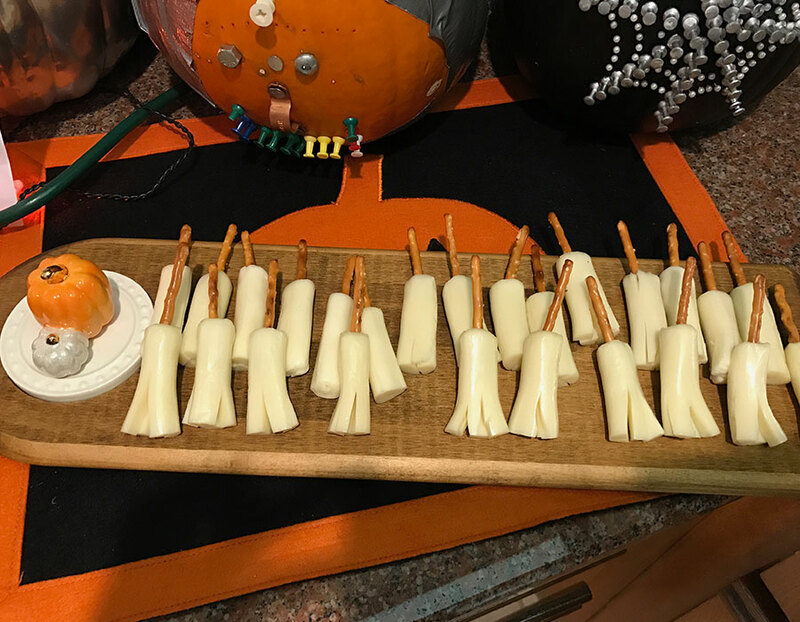 Halloween Cheese and pretzel broom sticks… so CLEVER! This pretzel and mozzarella stick broomsticks are ADORABLE. I love the presentation as well. Just two ingredients and a wonderful salty addition to a sweet buffet! Way to go, Carrie! 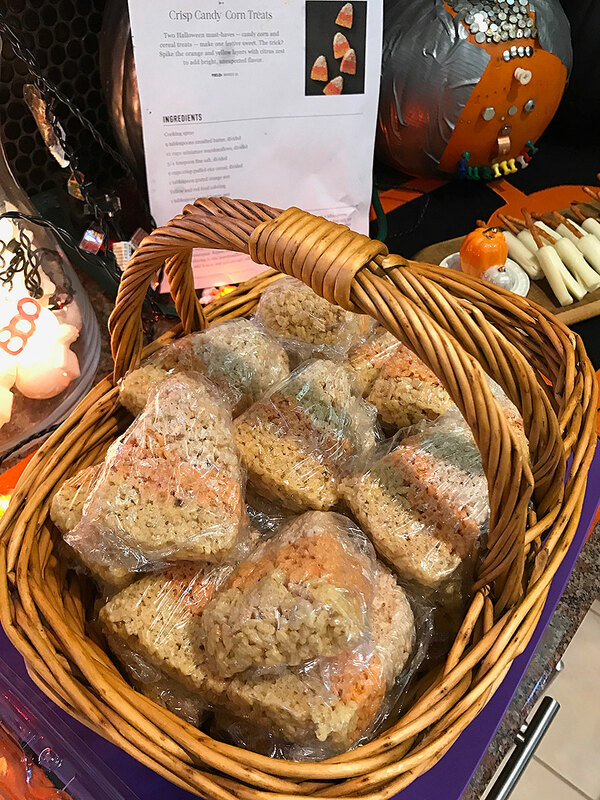 One of the moms brought these Halloween Candy Corn Rice Krispie treats. I love how she packaged them (many kids took one home as a favor), brought them in a basket, and even displayed the recipe for anyone else who wants to try making them. So thoughtful!! Helping herself to some Skeleton Guts! OOOOHHHH… SOOOO GROSS!!! But it’s Halloween… RIGHT??!! 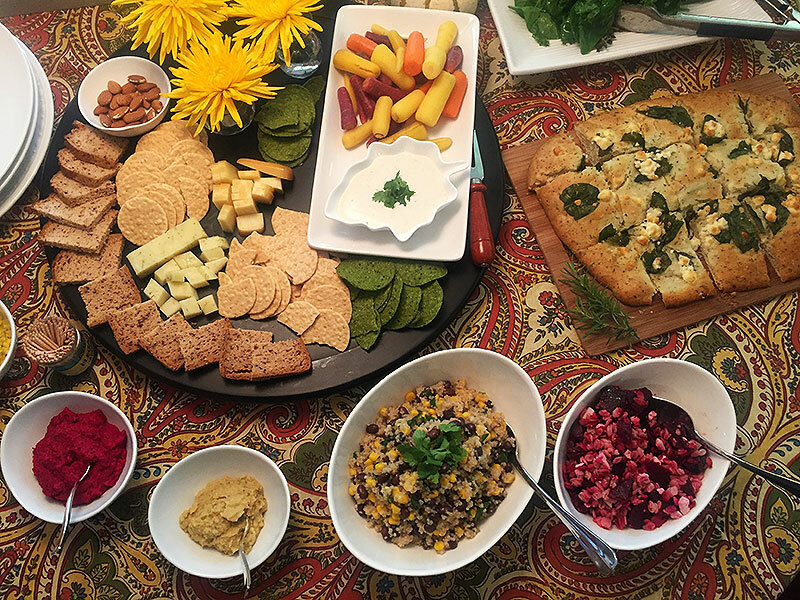 My friend Gina (not the one pictured above), is super creative and brought the ULTIMATE snack to the party! She needed some extra space and set-up time, but this incredible treat was a SHOW STOPPER!!! The kids loved it. 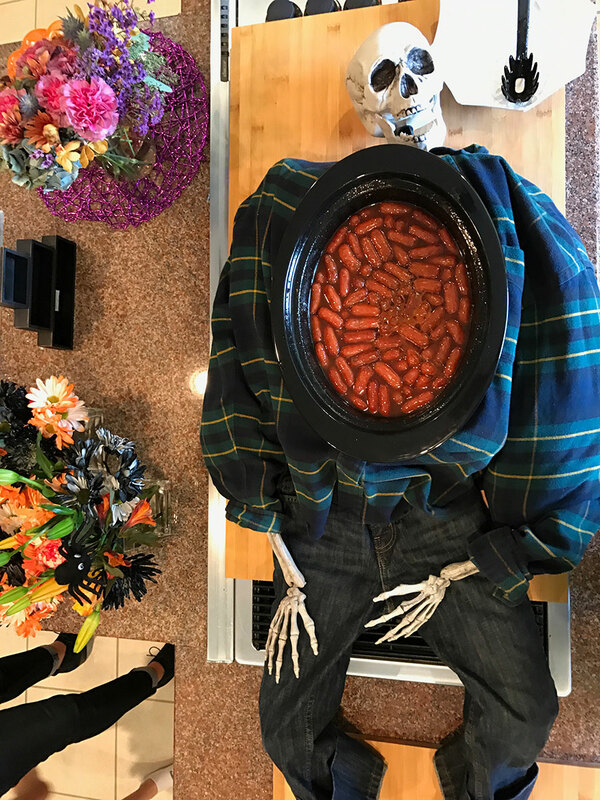 She dressed up a skeleton and inserted a slow-cooker inside his chest filled with BBQ mini hotdogs or cocktail smoked sausages. She also brought Hawaiian buns to pair with the mini hotdogs. The kids (and adults) had a treat scooping the “guts” or hot dogs on to their plate. I know… I know… not for the faint of heart, but it’s HALLOWEEN!!! 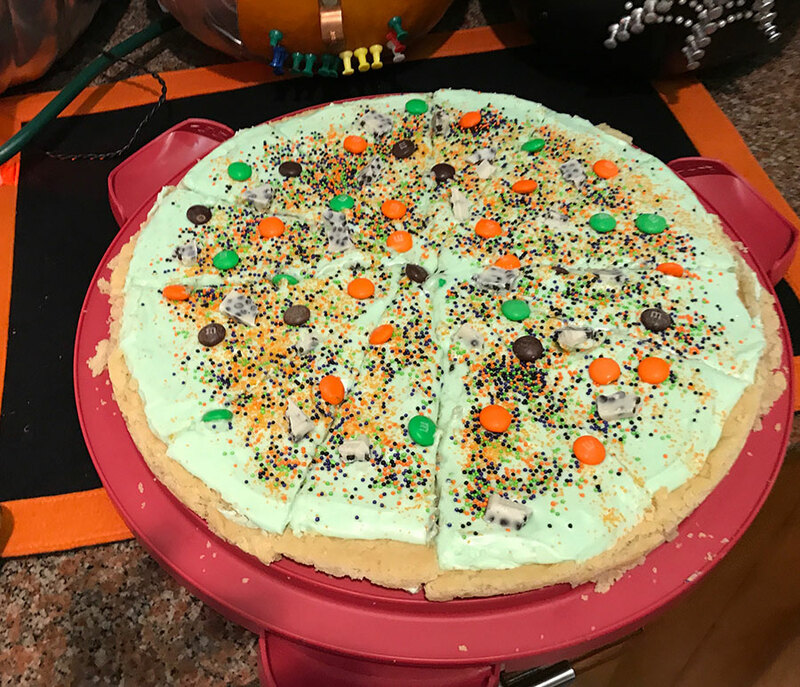 You can’t go wrong with a cookie pizza and this dessert was a fun treat for our guests. 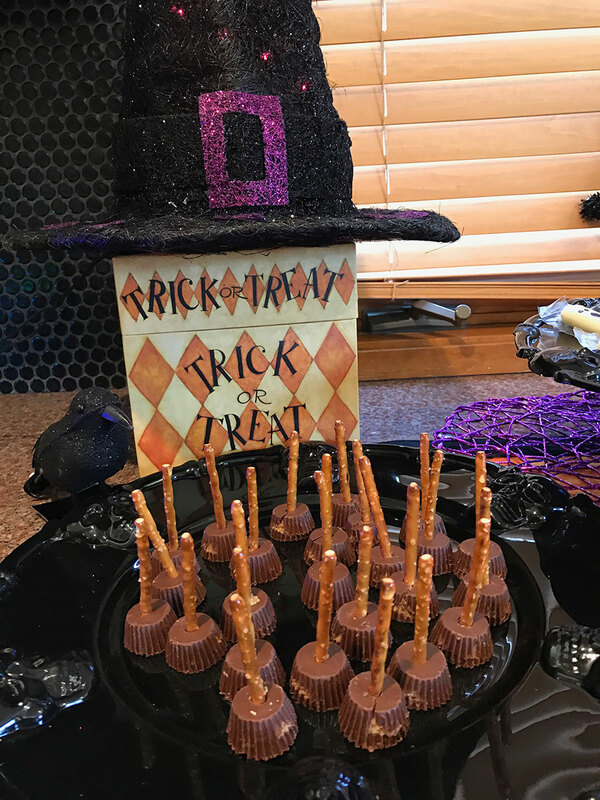 Loved this creative idea from one of our moms! 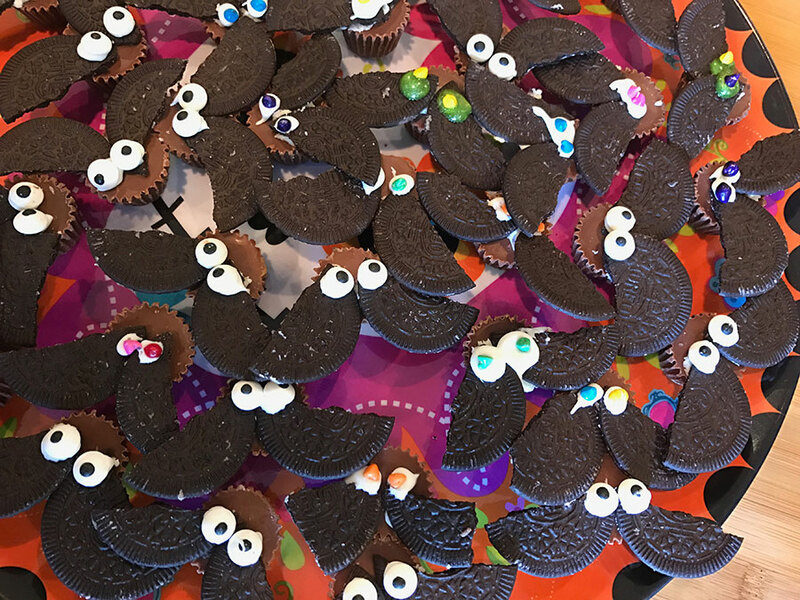 These adorable brownie monsters made everyone smile! 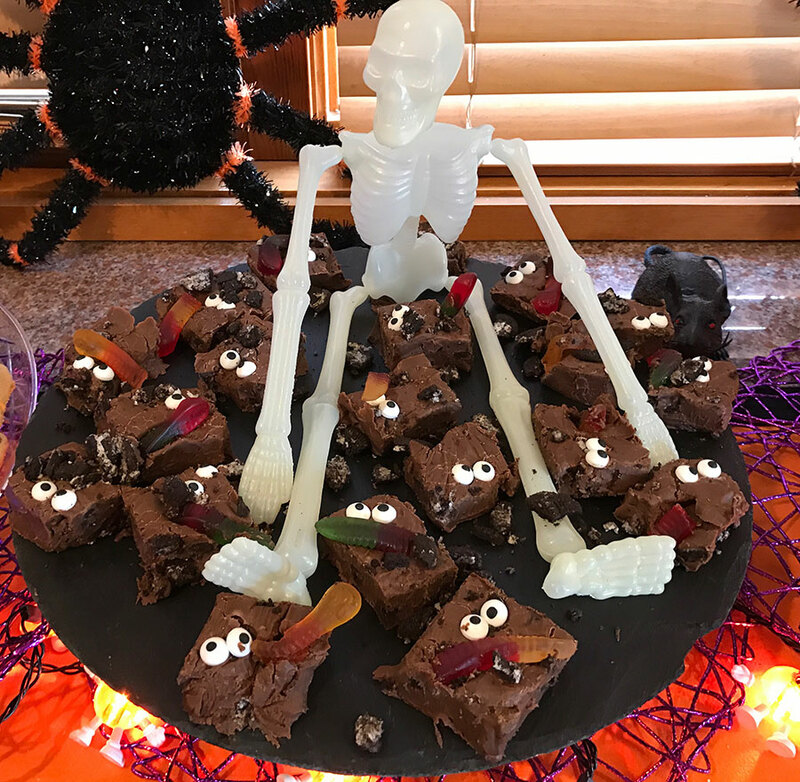 They are simple brownies with candied eyes and a gummy worm as a tongue! Another dessert winner on the buffet! 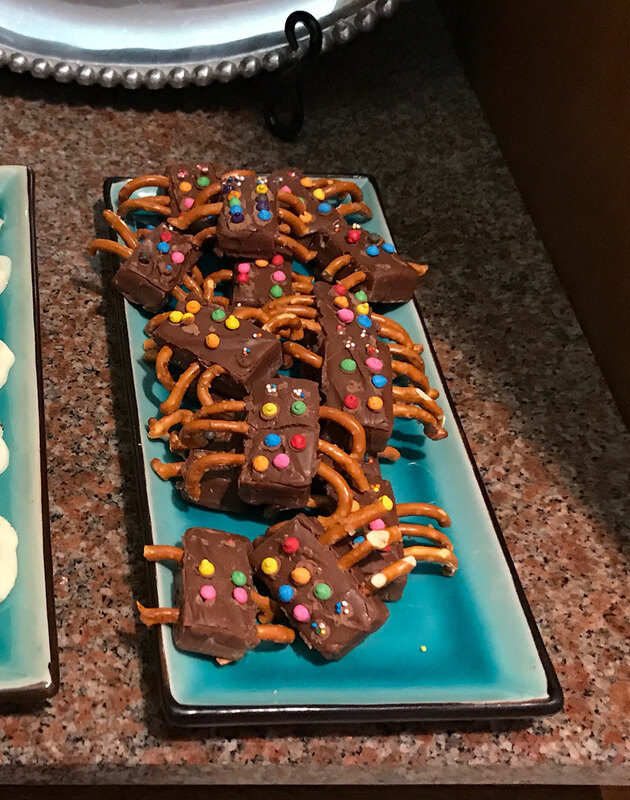 This dessert was such a fun idea Simply take any mini chocolate bar, insert pieces of pretzels for the legs and arms, and decorate with candy sprinkles on the body. You can make them look like anything, monster, spiders, and in this case, robots! Hate trying to make your cake pops look perfect? Here’s the answer! These wonderful cake pops did not have to be perfectly round to be winners. Once they were dipped in candy melts, they simply were allowed to free form. After the candy melts set a bit, the mom carved in some faces, which also did not need to be perfect. Two thumbs up for this fun and creative dessert! I love how these adorable desserts looked together! My Halloween flowers. 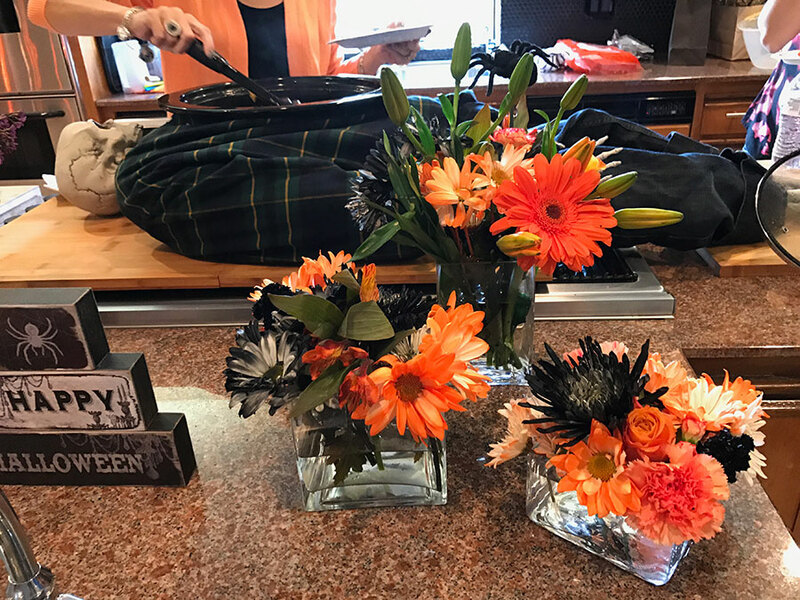 I love how some stores dye their flowers black during Halloween. It gives me so many ideas for arrangements. I also love the background of the skeleton. Sort of reminds me of a grave! Okay, now I’m getting a bit gory! 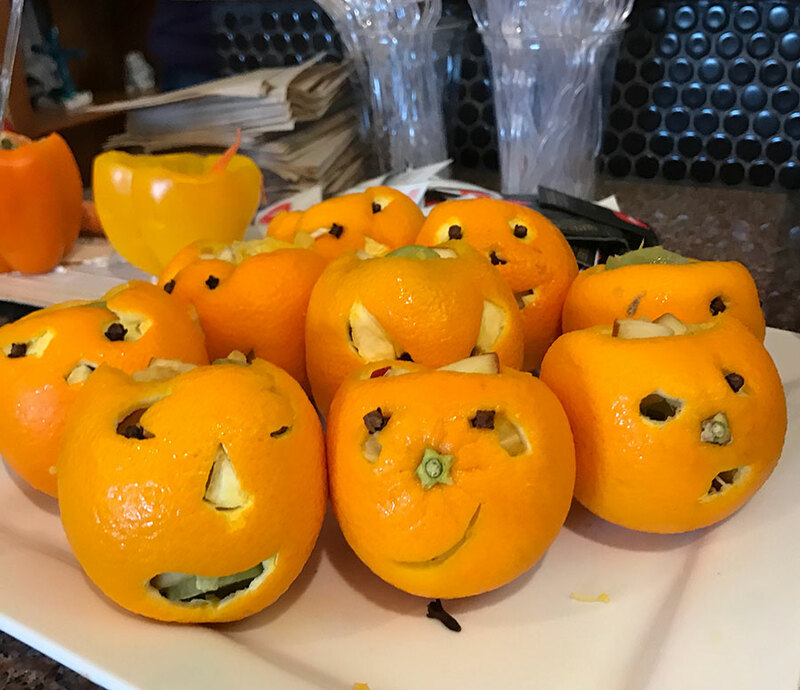 Halloween Orange Jack-O-Lanterns filled with fruit salad. I always give two thumbs up to anyone who brings healthy desserts. 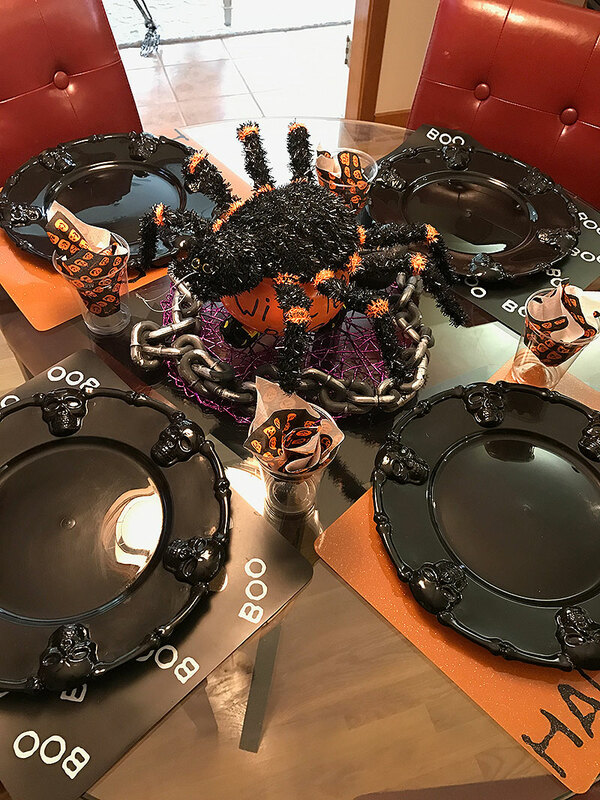 This mom went all out and created these fun Halloween orange Jack-O-Lanterns. She filled them with fruit salad and voila! As you may or may not know, I love to throw my two sons Halloween parties. I invite tons of kids and their parents and it becomes a fun potluck. I ask the parents to bring one Halloween dish they would love to showcase and they NEVER disappoint. 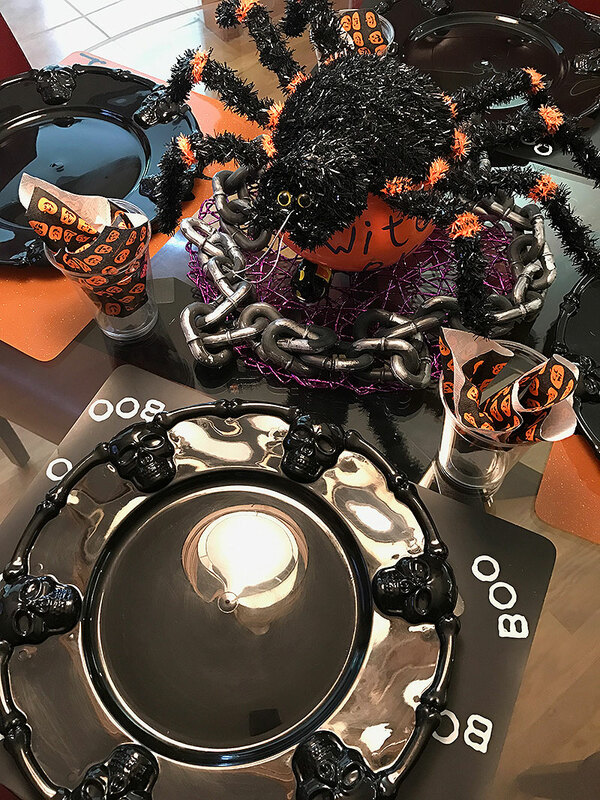 Here are some of the fun and easy Halloween dishes the parents brought to the party. 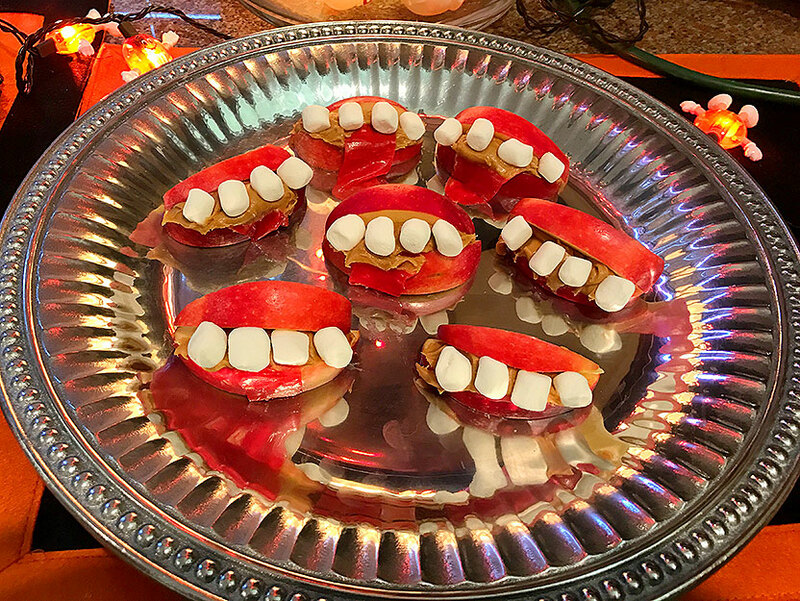 I love these delicious apple, peanut butter, and marshmallow treats made to look like monster jaws. The mom also added a fruit roll-up as the tongue. This was a fun treat for the kids. If you know me, you know that I outsource as much as I can, especially baked goods. When it comes to my annual Halloween parties, my favorite place to outsource from is Sam’s. 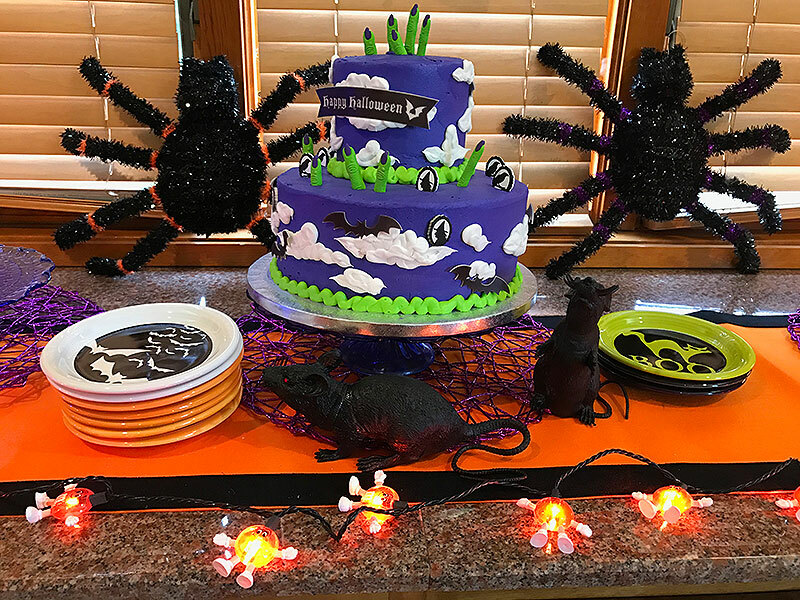 I order my Halloween cakes from there as well as any thematic cookies. 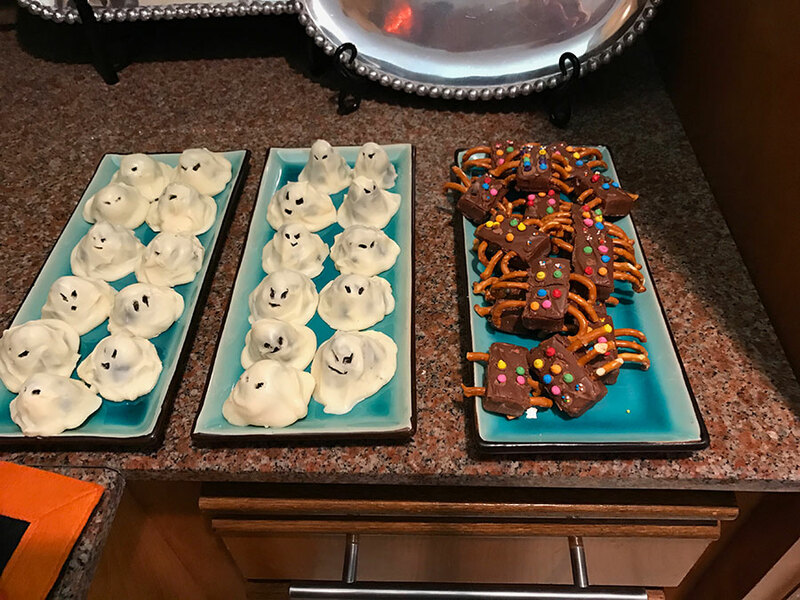 I would imagine Costco has the same fun desserts, but either way, buying in bulk is always a great thing for parties, so I highly recommend it! Best of all, these cookies were a fraction of what I would pay for custom designed cookies. You cannot help but fall in love with this adorable dessert created by my friend Zalina. Dirt n’ Worms! I love how she used fun black kettle containers. Needless to say, I don’t think we had any left over!! 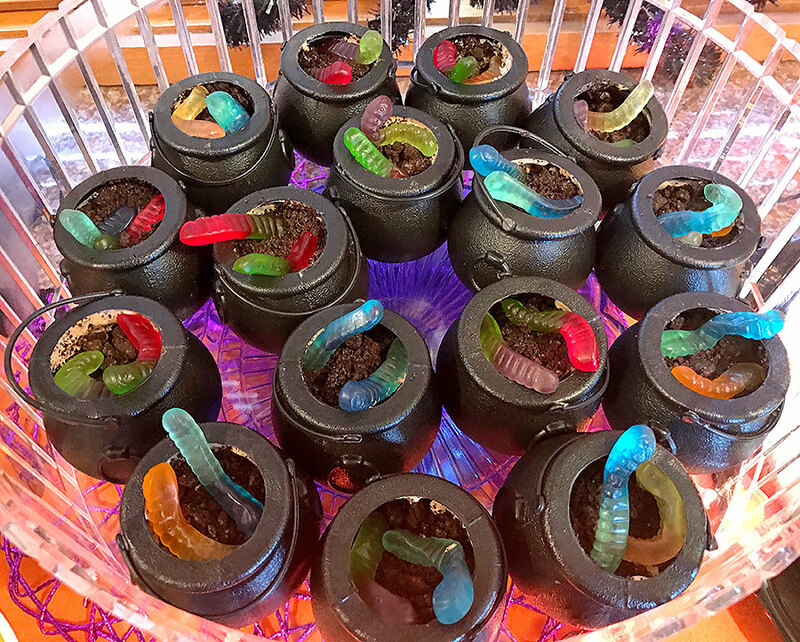 They are filled with chocolate mousse (or you can use pudding), crumbled Oreo cookes, and gummy bears. 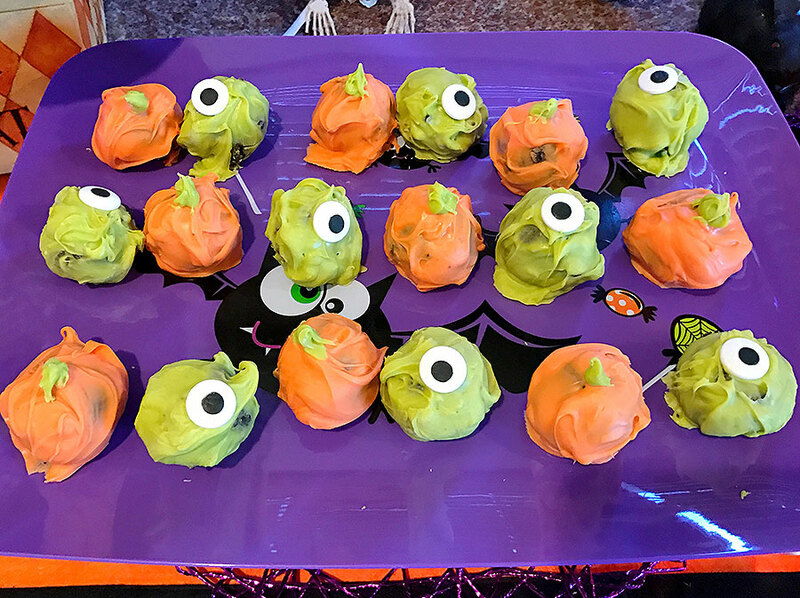 My friend Tara did NOT disappoint with these fun and funny Monster Eye Cake Pops! We all know how hard it is to make cake pops look perfect… well, with this theme, the more imperfect the eye is, the better! She made a regular cake pop mixture, rolled it, and dipped it in candy melts. Last but not least, she popped a candy eye on top and VOILA!!! Seriously… can these be any cuter? 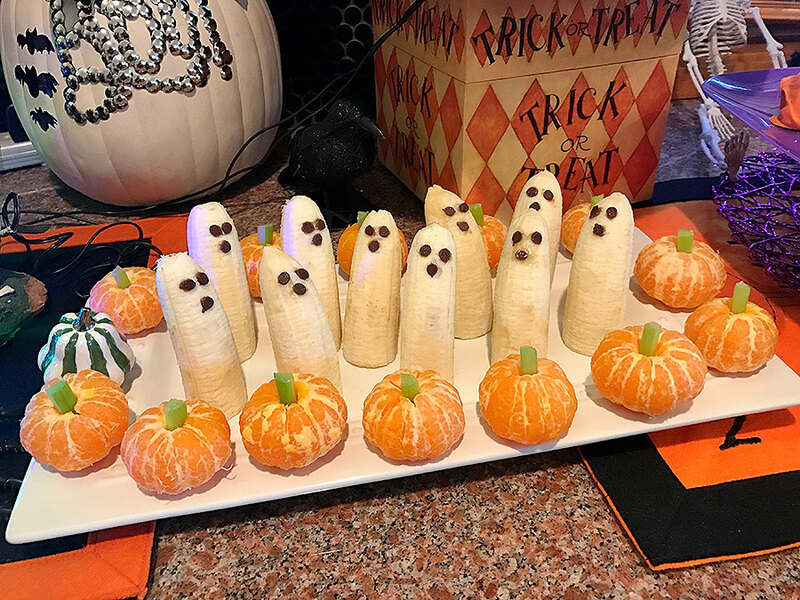 My friend Jenna created these adorable tangerine pumpkins and banana ghosts. Adorable and healthy!! 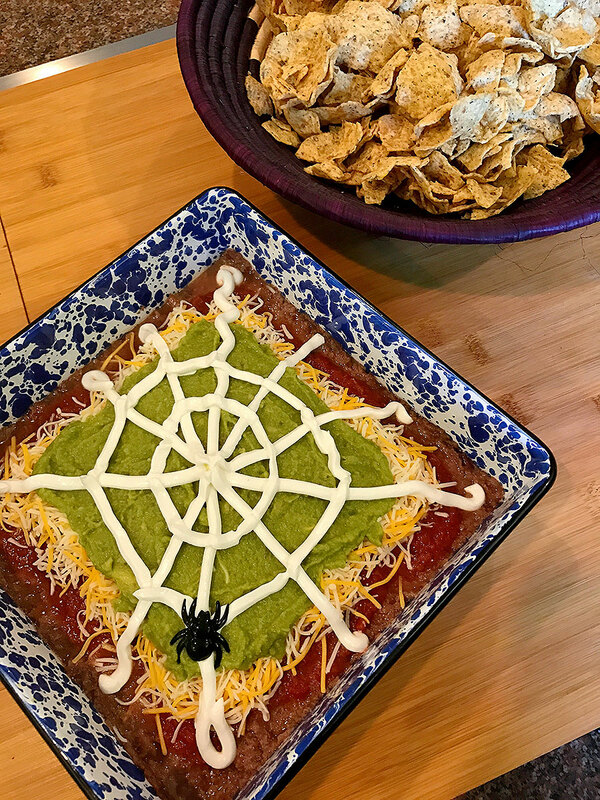 I’ve made spider web dips before, but mine NEVER came out so cute! This was a delicious seven layer dip created by my friend who is an incredible entertainer. 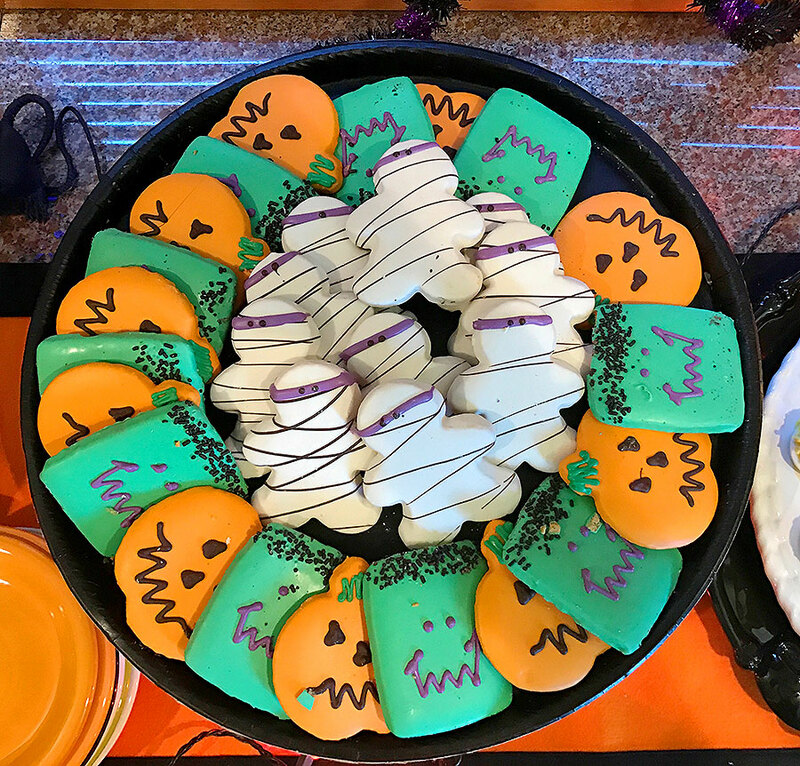 This Halloween dip was a HIT and was the perfect savory accompaniment to all the sweet items on the buffet. DELICIOUS!! Some of the kids enjoying the Halloween buffet. The calm before the storm. This was early on in the party when just a few kids arrived. I typically have fifteen or more people hanging out in my kitchen which include adults and children. When the party starts, everything is so well organized and displayed. By the end of the party…. it’s not a pretty site! My friend created these fun Halloween Bat Wings from Reece’s Peanut Butter Cups, Oreo Cookies, and candy eyes. They are ADORABLE! It’s Halloween! Time For Easy Push Pin Pumpkins! My collection of easy Pin Push Pumpkins. 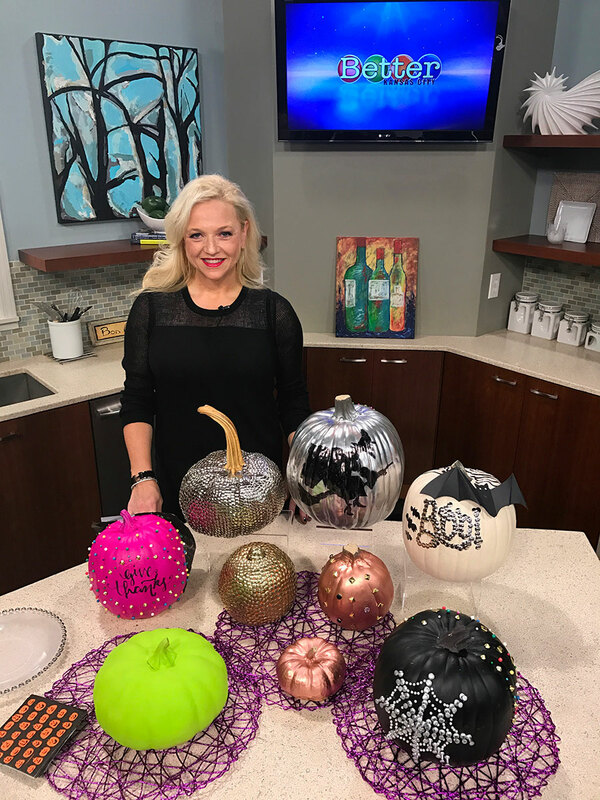 I loved this segment I did with Better Kansas City on super easy pin push spray-painted pumpkins. I also made them two-sided, which means I made one side Halloween themed and the other was Thanksgiving themed. I also made some universal designs which can be displayed during Halloween and Thanksgiving. 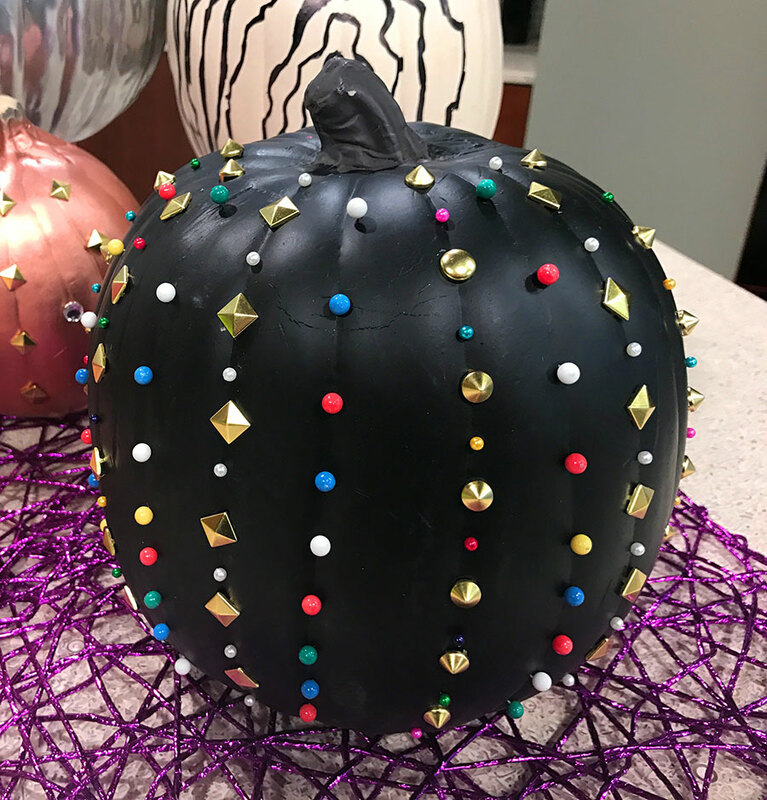 This is a black pumpkin which I designed to look like the Valentino “rock-stud” collection. 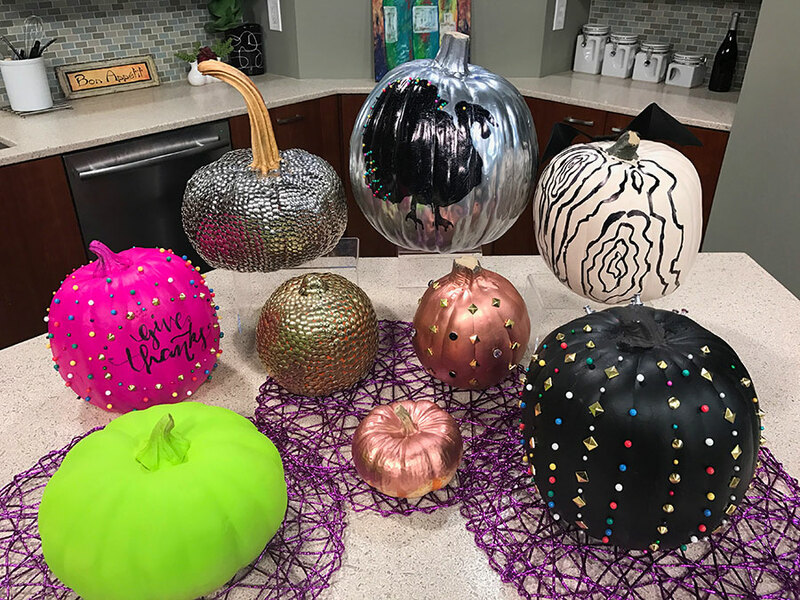 It is a fun and colorful way to bring a little influence of fashion into your pumpkin decor. This was the “Thanksgiving” side, the other side was a Halloween side which had pins made into a web. Check out the previous photo. It’s the black pumpkin on the right. Halloween side of all the pumpkins. This is the Halloween Side. Each pumpkin has a Halloween theme. The silver one has a silhouette of a witch on a broom. The white has silver pins saying “Boo” and the black one has the spider web. 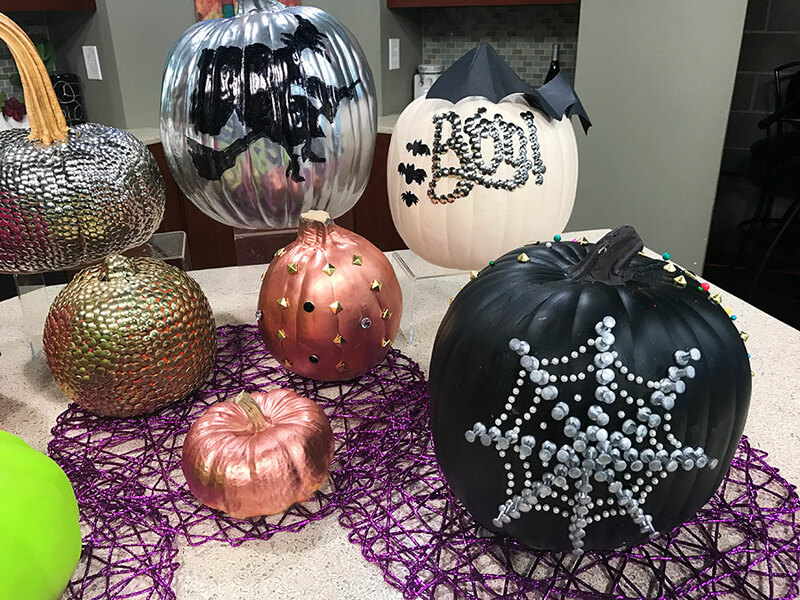 This is the “Thanksgiving” side with the silver pumpkin having a turkey, white pumpkin having a wood-grain theme, the black pumpkin having the “Valentino Rock-Stud” look. I also love my silver and gold thumb-tack pumpkins. Be warned, they take HOURS to create. I started in September pushing in the thumbtacks while watching TV with my husband. They are time consuming but are well worth the time. I also used a real pumpkin stalk as a finishing touch. The stalks last for years and years, so you don’t have to worry about them rotting. 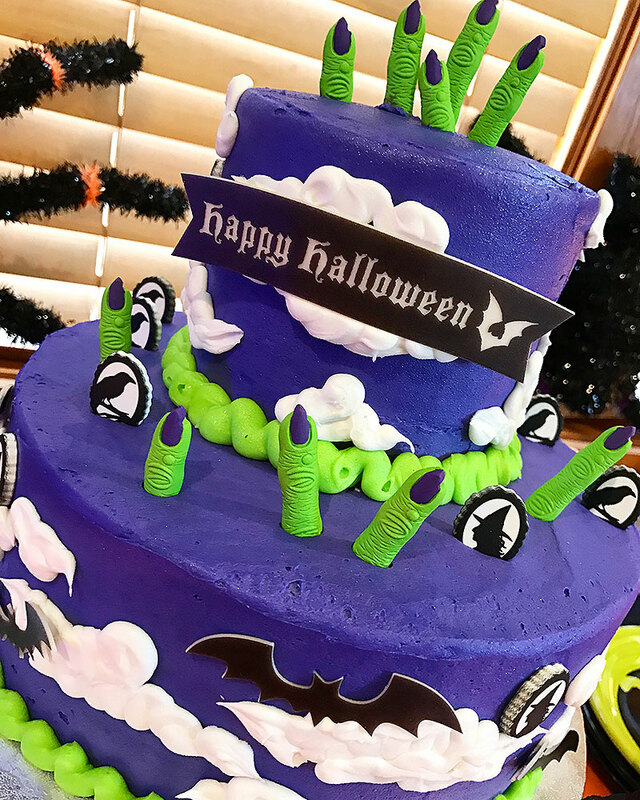 Loving this beautiful Halloween Cake with Green and purple witches fingers. I have thrown fun Halloween parties for many years. I usually throw a party every week in October… yes, every Friday, I will have some sort of a Halloween party. 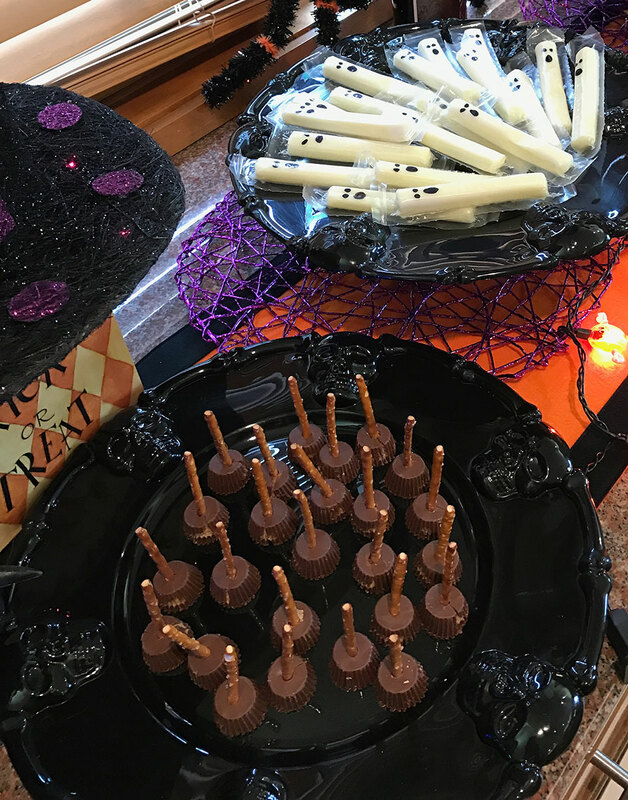 I like to call them “taste testing parties” since the guests are bombarded with fun Halloween goodies and they get to choose their favorites. 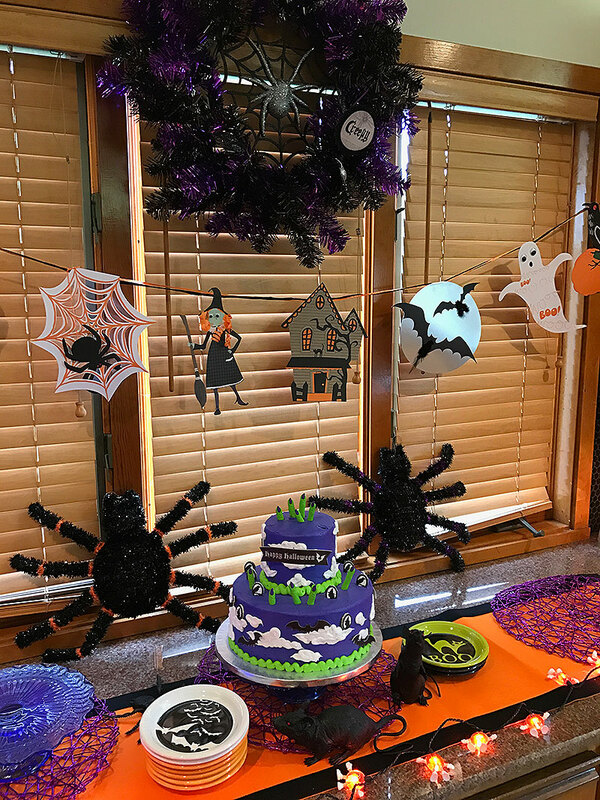 Sometimes I create all the items for the buffet, but most of the time, other parents bring their creations and we all just watch the kids devour their favorites. It has become one of my most fun and exciting events which I look forward to. 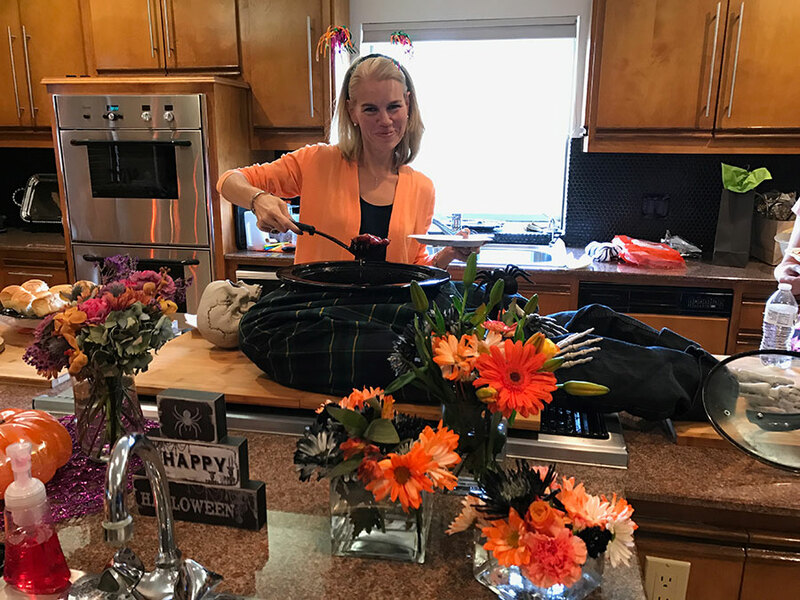 As you will see, I try not to do anything super scary, although I have been known to create some gory dishes on occasion (like my severed fingers hot dogs, which is a Pinterest favorite!). 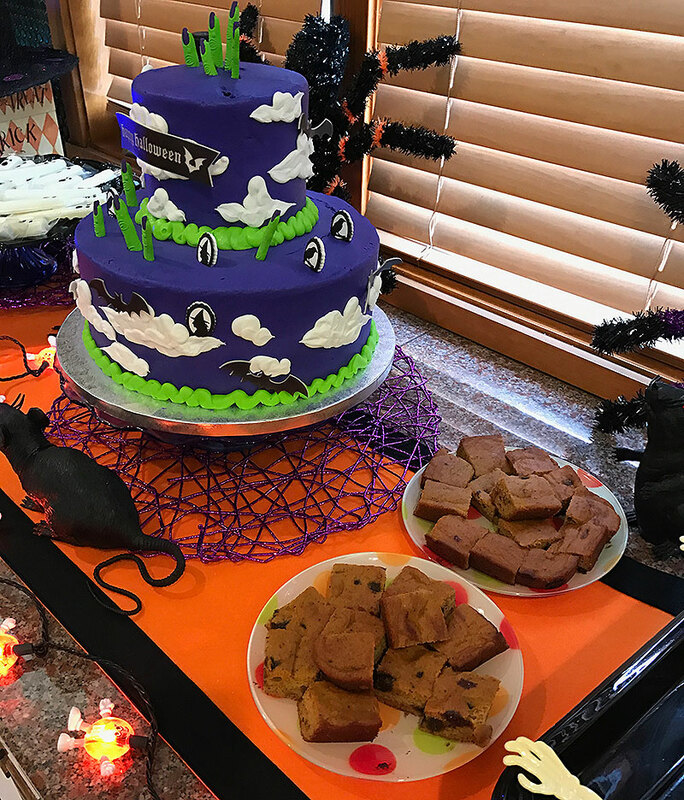 Here are some fun photos from one of my parties, which I like to call Purple Witch’s Finger Cake (shown above). You may say… “Why Arina, I had no idea you were a cake baker!” Well, rest assured… I AM NOT!!! If you know me, you know that I am well aware of my limits. Throwing a party for 60 children means I do as much outsourcing as possible. This cake was ordered from Sam’s and I simply chose it from one of their cake catalogs, available in the bakery section.. 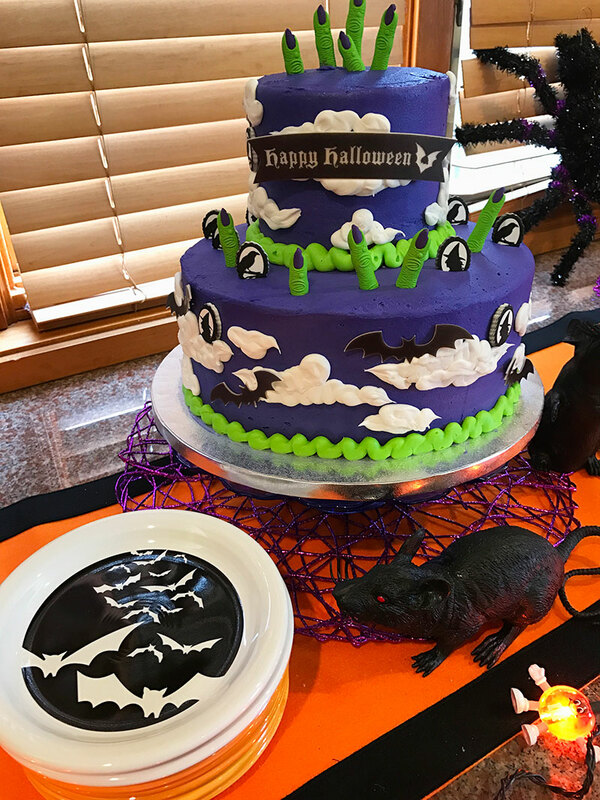 It came with the purple, green, and white frosting, clouds and bats. The cake bakers did a great job making a two tiered cake. There were times when I would order the three tiered ones, but they always came out crooked, so I stick with the two tiered cakes. To customize it to be a Witch’s Cake, I went to Michael’s and purchased the fingers and witch silhouettes separately. I have NO idea how the colors came out so perfectly, but even if they didn’t match, … my motto is and will always be… kids don’t care! I was very happy with the cake and so was everyone else. Oh, and it was soooo affordable, only $40! 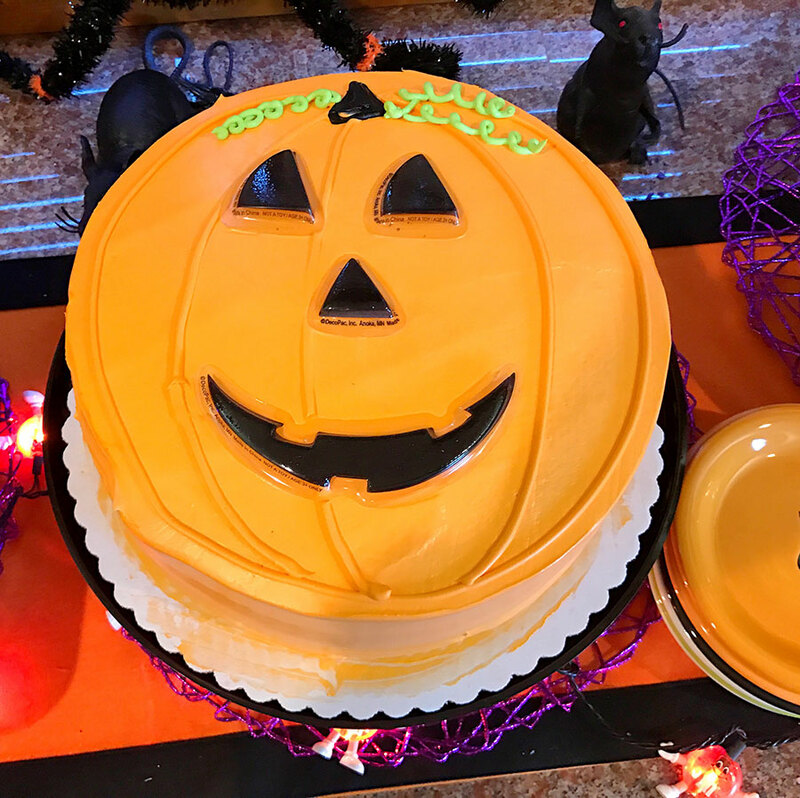 Cake with fun Halloween plates, my friend Heidi gifts me with every year. 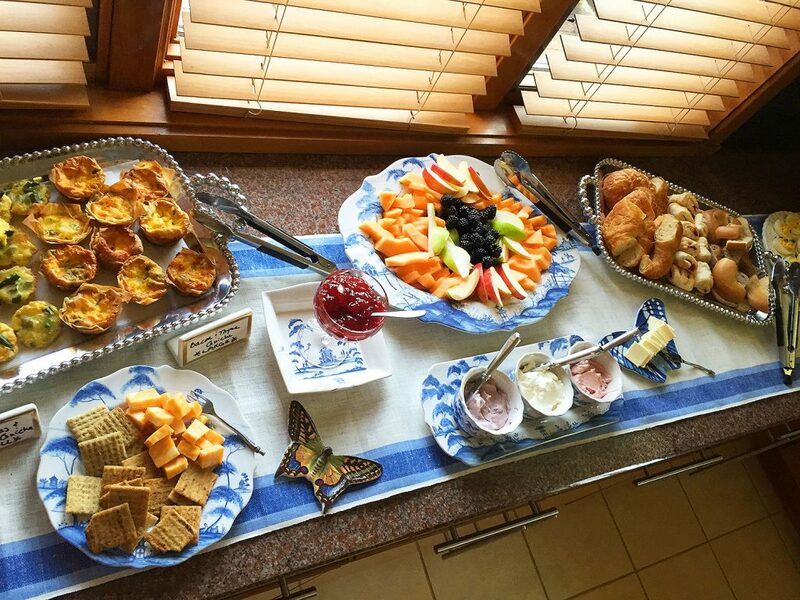 I typically do a buffet set-up and provide the cake and a few other dishes. Then, the parents of the guests bring their favorites. Parents are always invited to the parties and are encouraged to stay and enjoy the festivities. 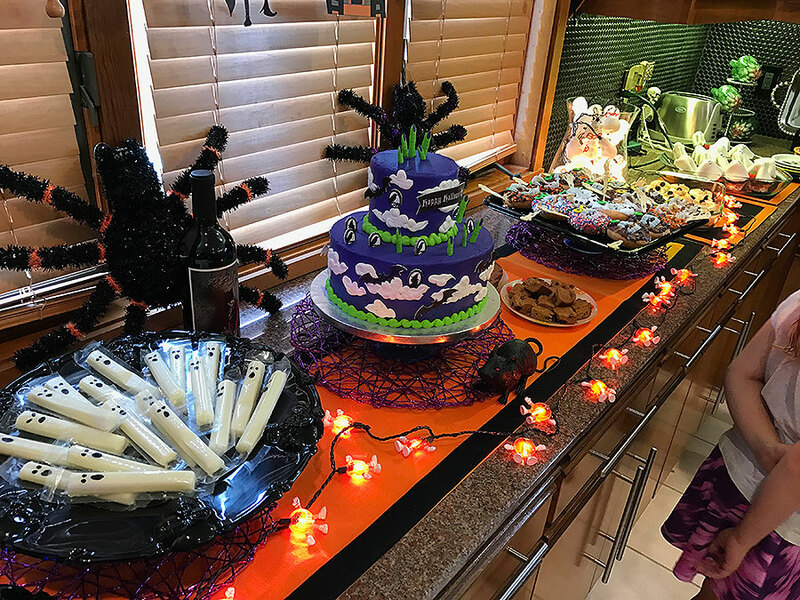 Here are some of the fun and creative Halloween inspired desserts created by my guests’ parents. 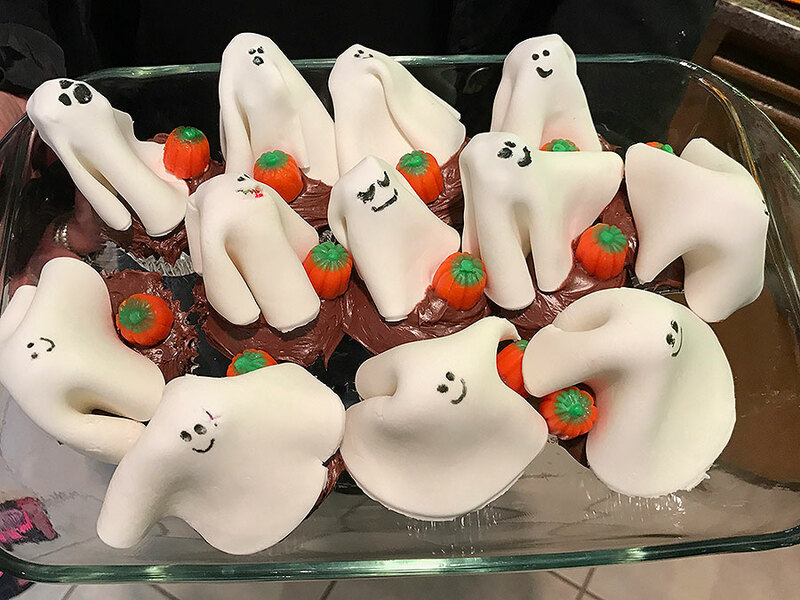 Adorable cupcake ghosts created by my friend Deborah. 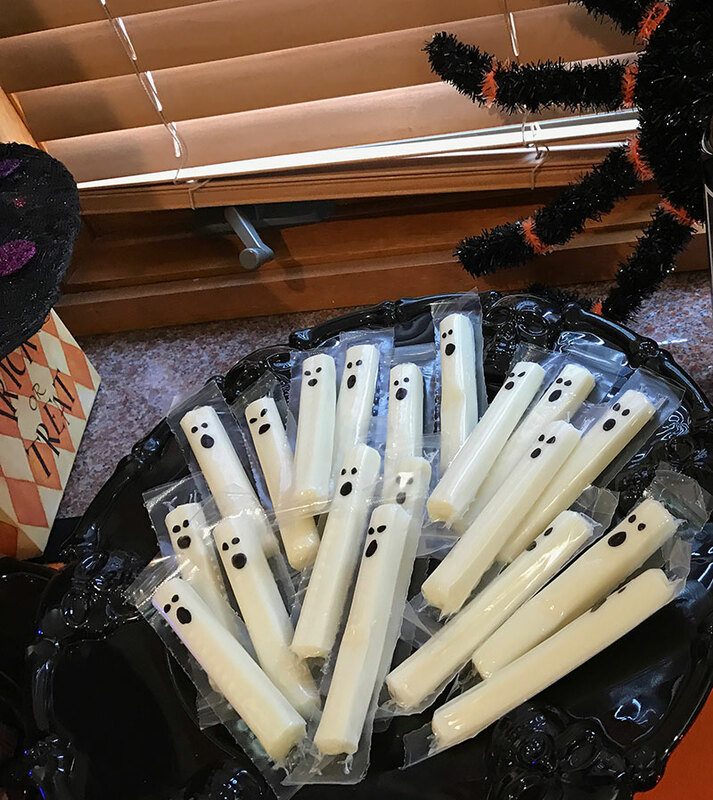 Cheese Stick Ghosts… so clever and easy! 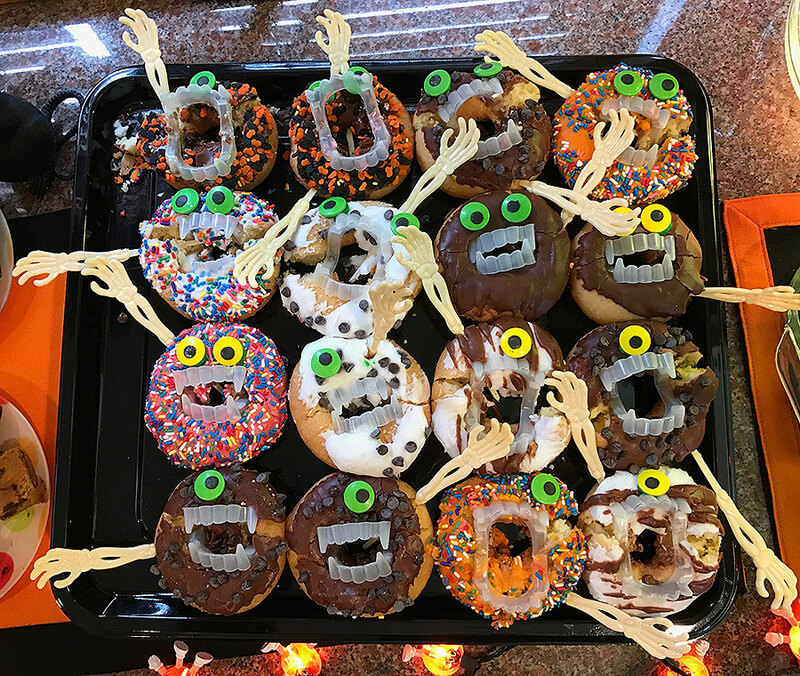 These wonderful Donut Monsters were created by my friend Maureen, who is incredibly creative and no stranger to wonderful Halloween parties. Apparently, they took her no time to create. 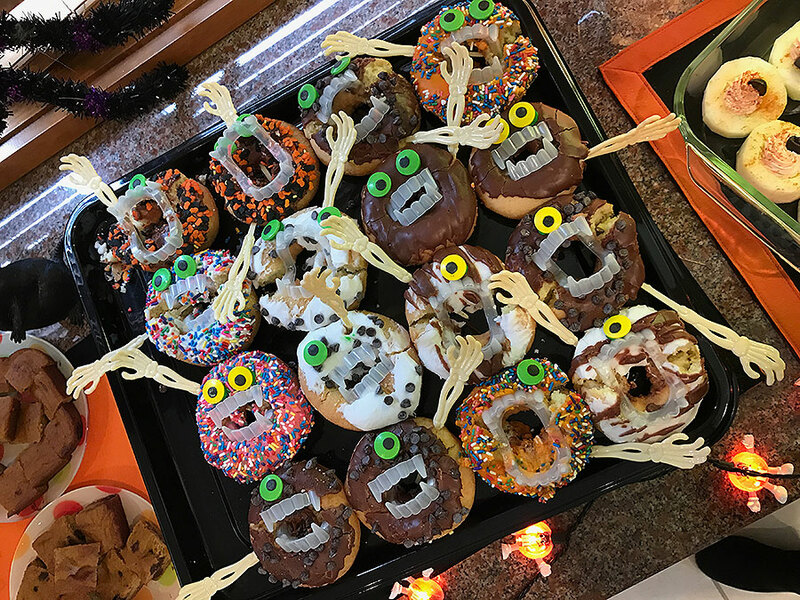 She purchased ready-made donuts, then stuck fake teeth and skeleton arms inside them and some candy eyes. That’s it! The kids loved playing with the fake teeth afterwards and took them all home as favors. 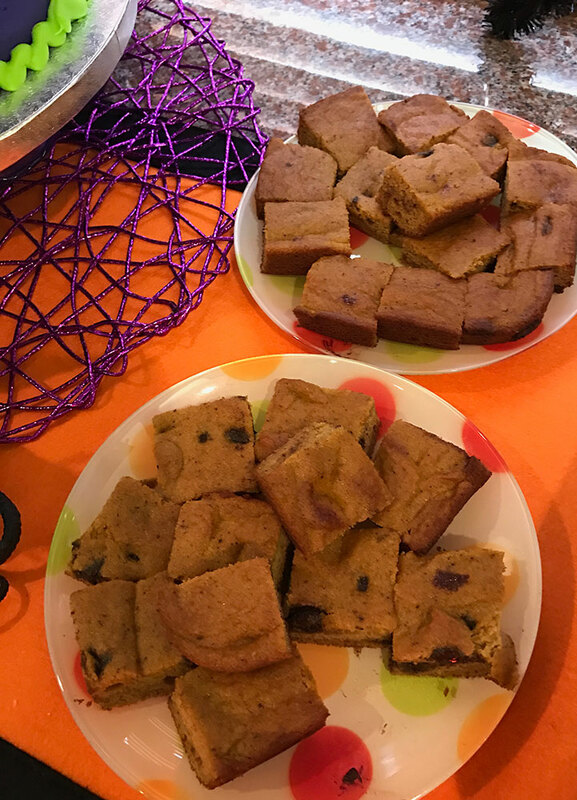 Yummy and healthy pumpkin bread, prepared by my friend Dana. 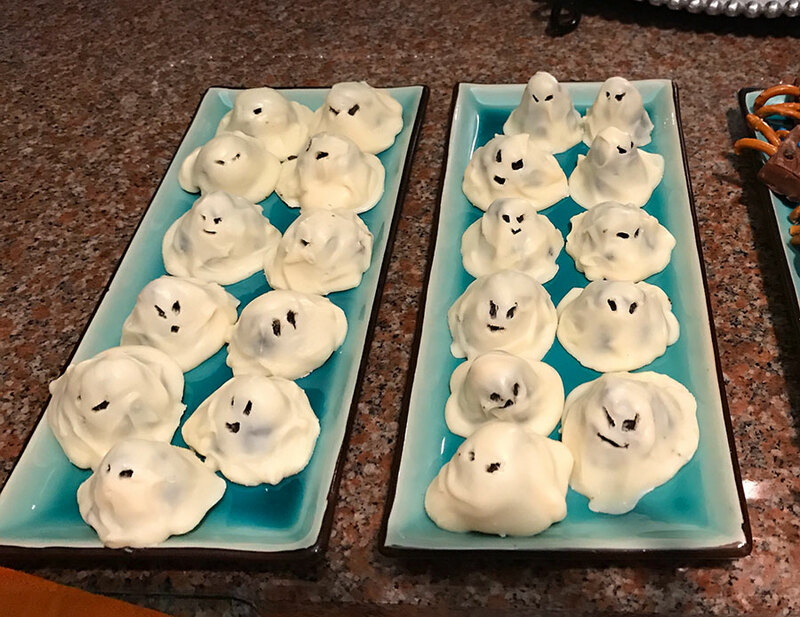 This is such a wonderful and easy Halloween dessert, created by my friend Nicole. They are witch’s brooms. 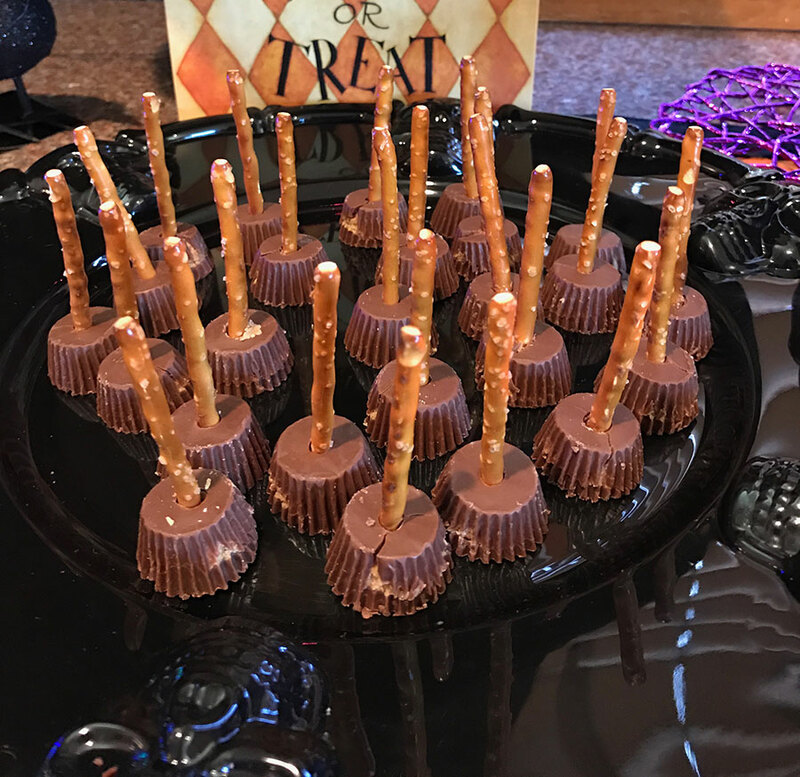 Two ingredients … Reece’s Peanut Butter Cups and Pretzel sticks… you’re done! 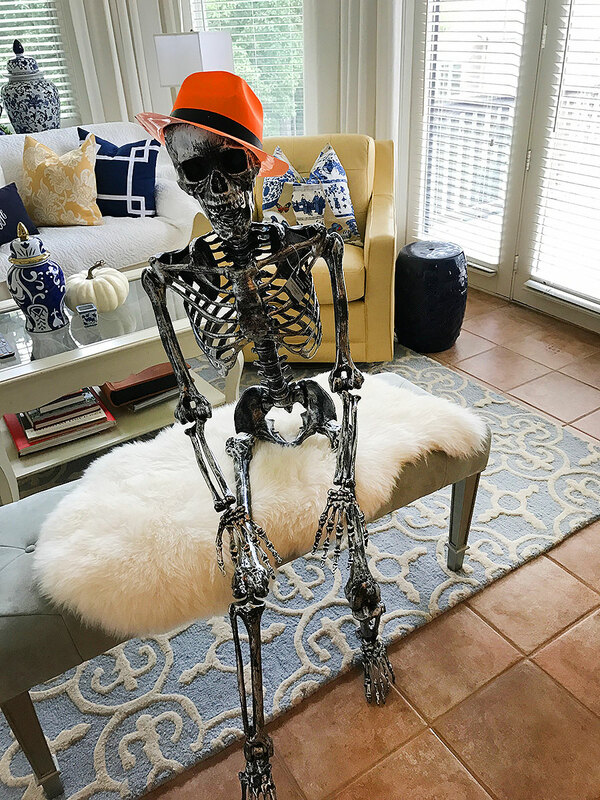 This skeleton appears in different parts of the house at every party. At this party, he’s hanging out in the sunroom! I re-use many of my decorations at each Halloween Party. As I said, kid’s don’t care and there is really no reason for me to keep buying decorations when I have plenty stored away from my previous parties. Sometimes, I even get decorations gifted to me by other moms who’s kids may no longer be living at home. 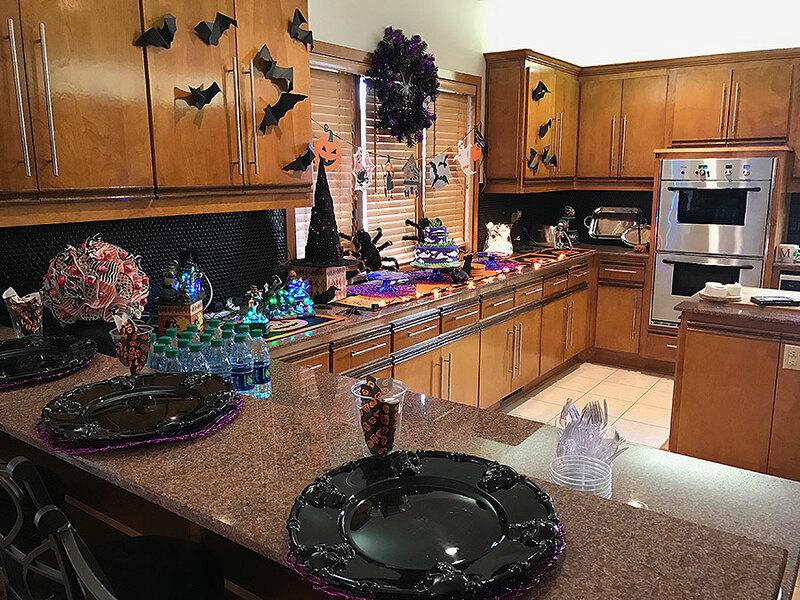 I truly believe that re-puposing and re-using, as well as borrowing is the best way to decorate for a party. As I was going through my photos, I stumbled upon this beautiful fall wedding which I think is wonderful to showcase during my October post. 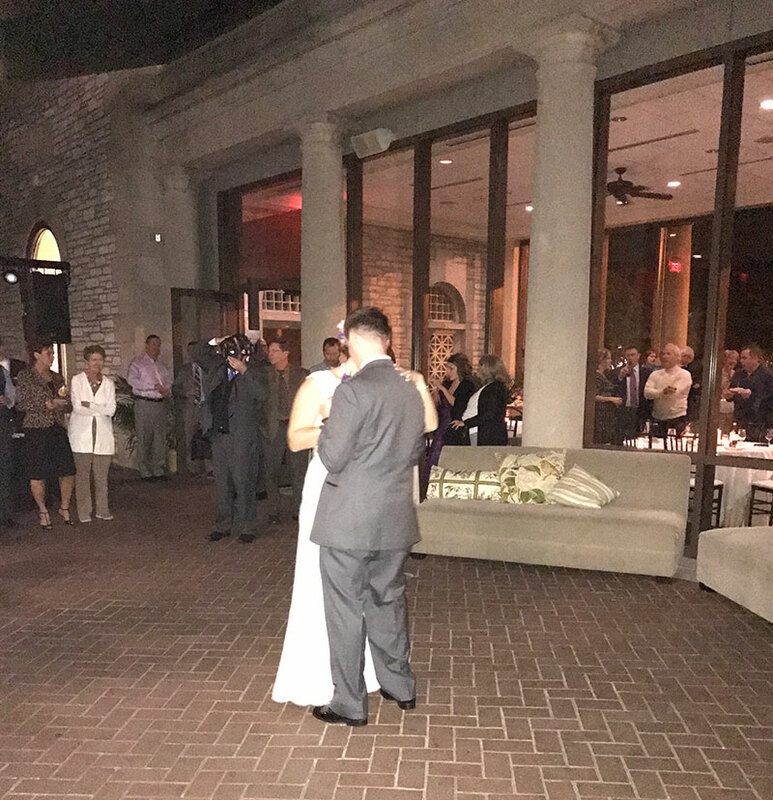 My husband’s cousin, Elliot, married the love of his life, Dawn, in St. Louis. 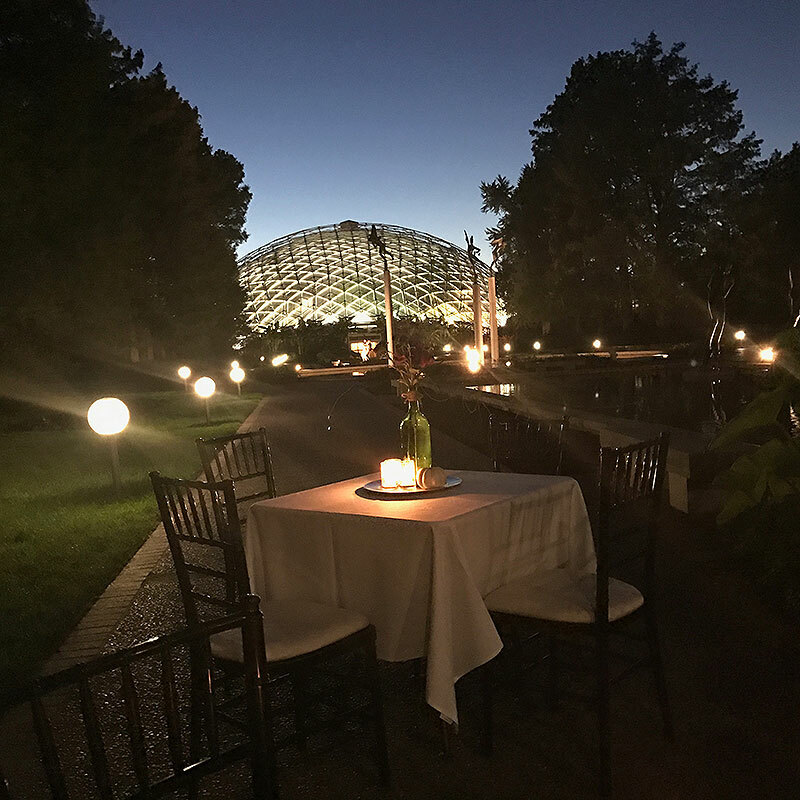 Their reception was at the St. Louis Botanical Gardens and it was spectacular. 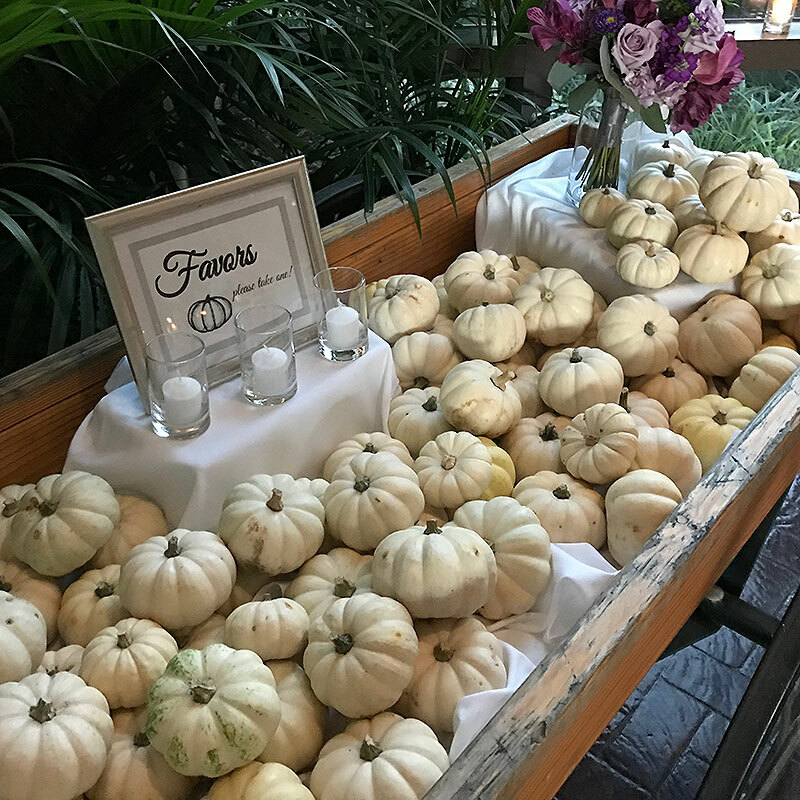 I loved all the beautiful fall details as well as the personal touches Dawn incorporated into their wedding design. Beautifully done, Dawn and Elliot! 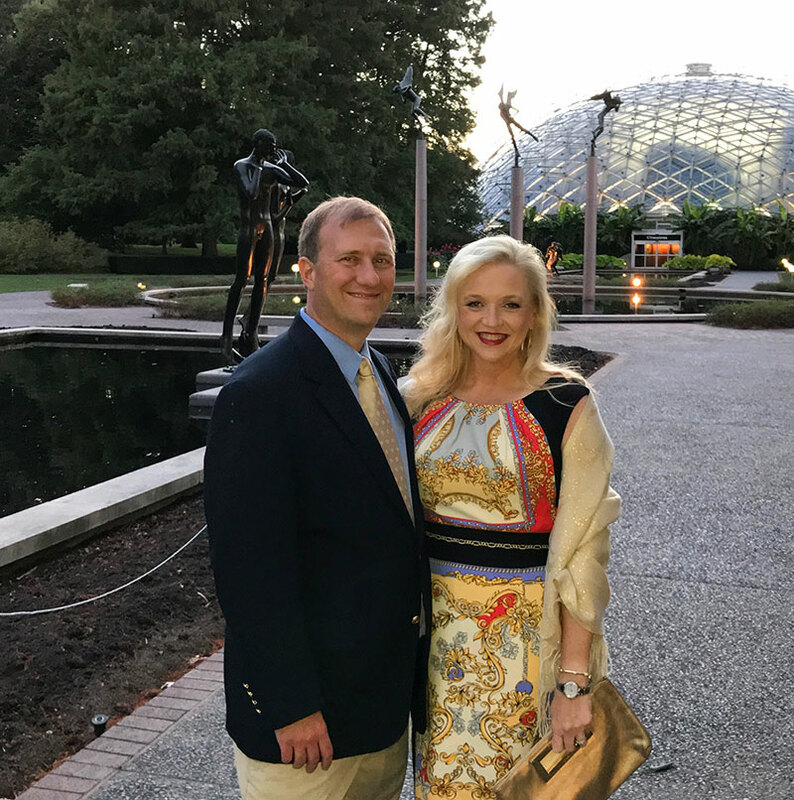 My husband and I enjoying the setting at the St. Louis Botanical Gardens wedding reception. 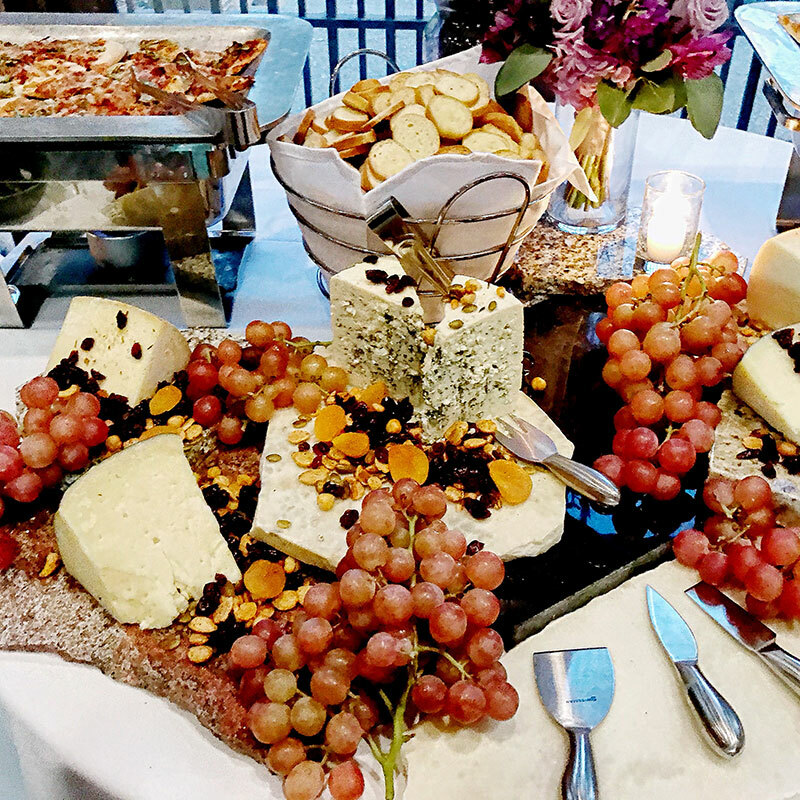 Wedding dinner buffet filled with a large assortment of delicious cheeses, fruit, and appetizers. 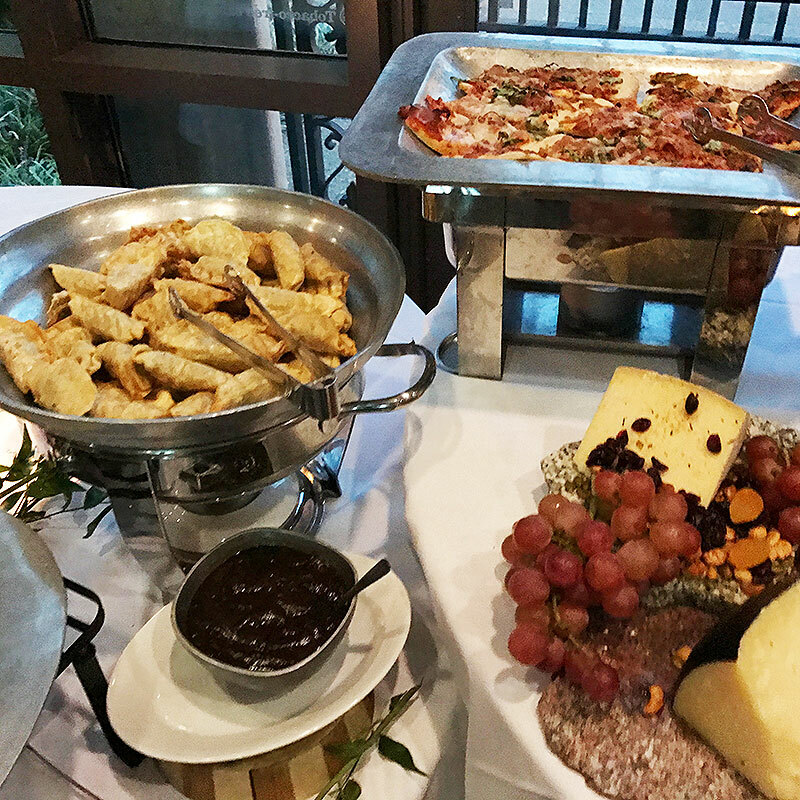 Dawn and Elliot’s dinner buffet was overflowing with delicious menu items which included fruit, nuts, crackers, breads, and lots and lots of different kinds of artisanal cheeses as well as a huge selection of hot appetizers. 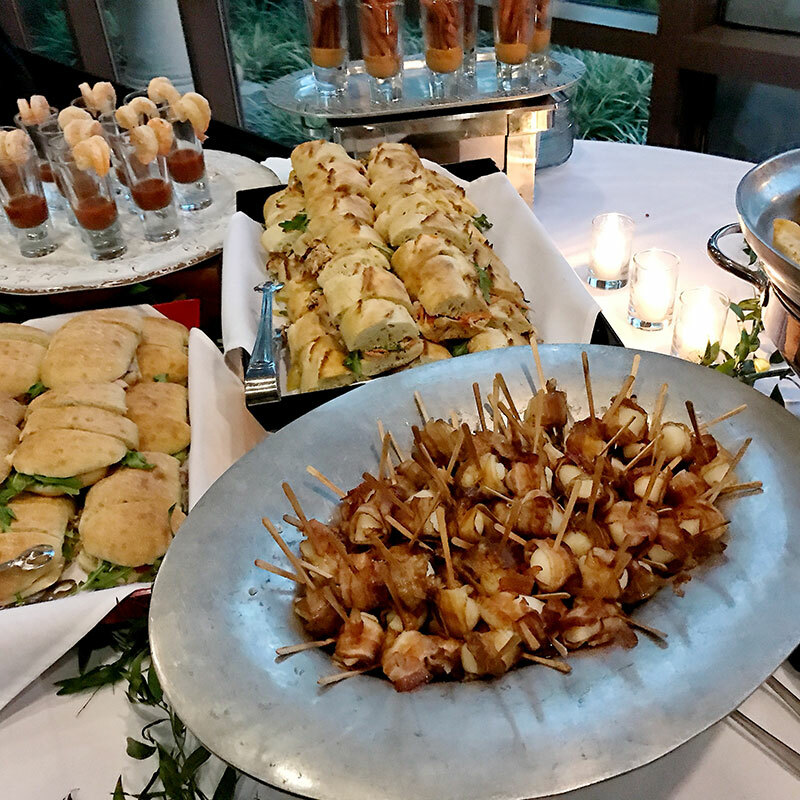 Hot d’oeuvres were also served and they were absolute perfection! Bite sized sandwiches as well as shrimp cocktail shots were also on the buffet. They were displayed with such clever creativity. More hot d’oeuvres! Bacon wrapped scallops… YES! I love how the serving platters are all different. 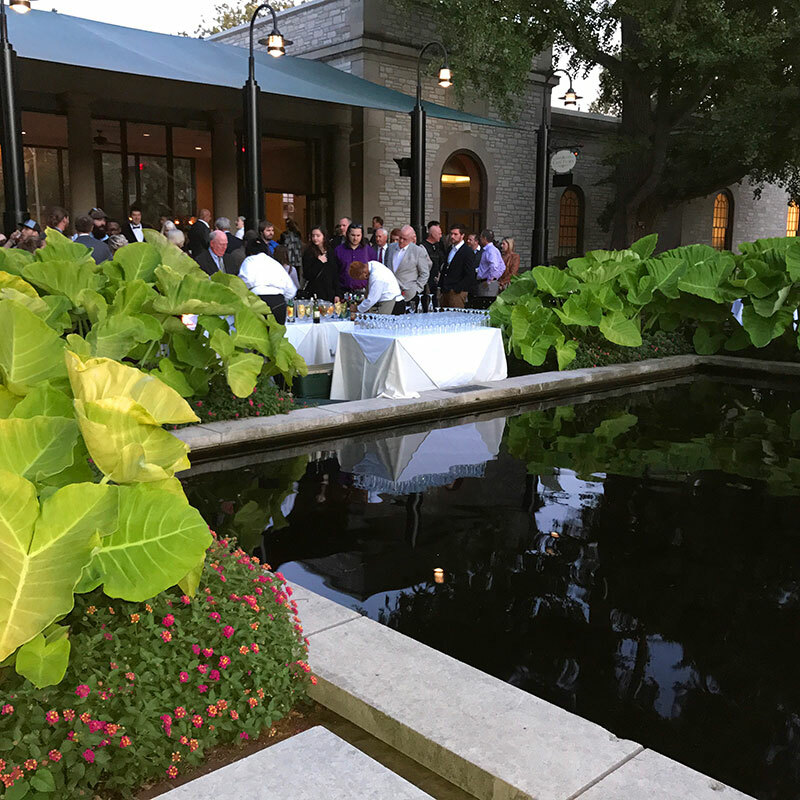 The reception was outside, the weather was perfect, and what a beautiful view! 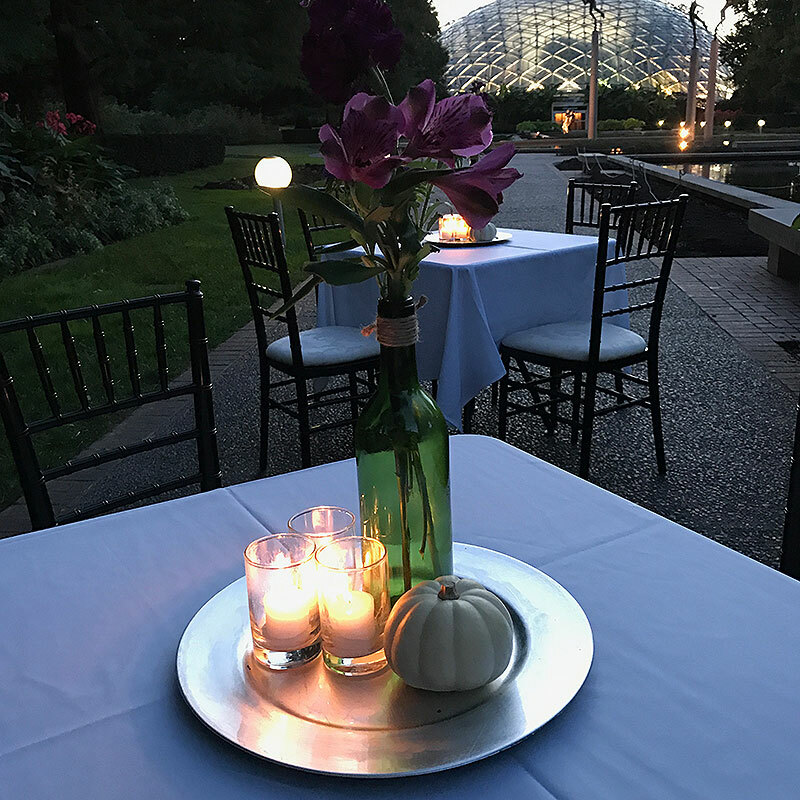 Love this simple yet creative centerpiece. You don’t have to spend a ton of money for perfection! LOVE IT!! 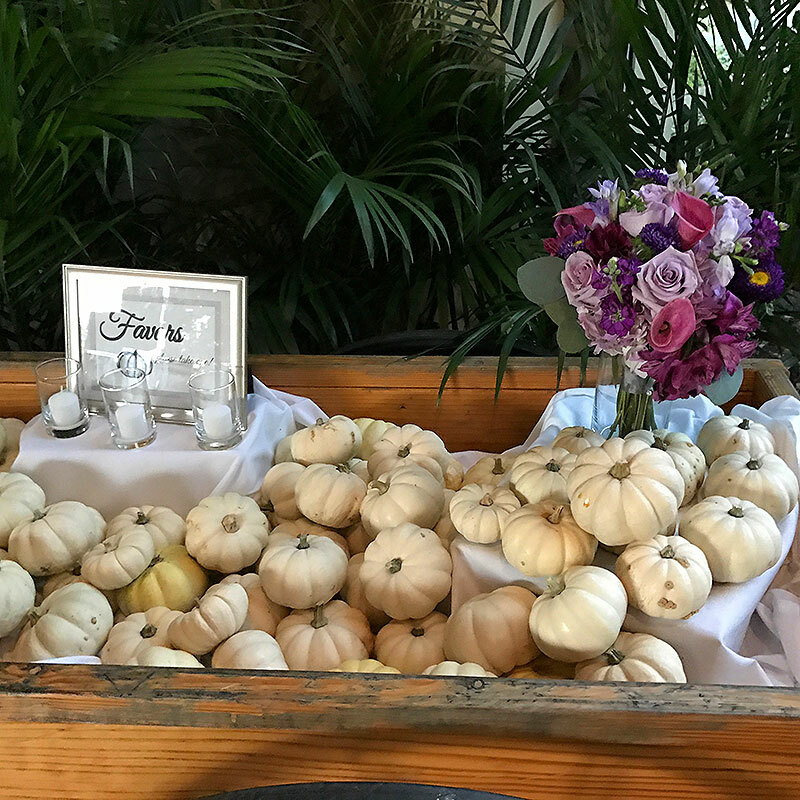 Obsessed with this pumpkin cart filled with white pumpkins for guests to take home. Who doesn’t want an adorable pumpkin to take home and enjoy in October? 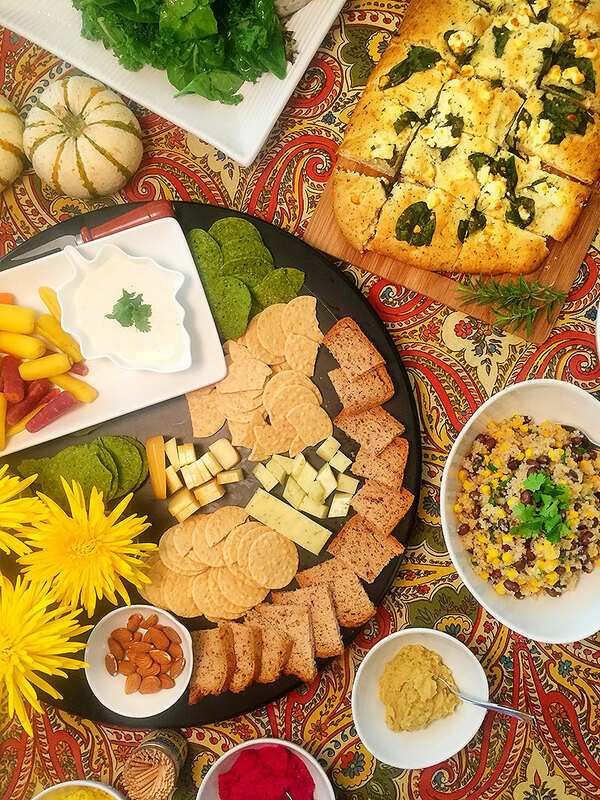 Had book club at my house again and wanted to create a beautiful “fall” appetizer table… but nothing too complicated. I had some hummus left over from the weekend… beet hummus and basil hummus. Additionally, I prepared some quinoa Mexican inspired salad with corn and beans. It was DELICIOUS!!! I also prepared a beet salad because I LOVE to add red to my menu. For a healthier alternative, I served greens so that people can build a salad foundation with lettuce and spinach and then top it off with the quinoa or beet salad. The appetizer platter was very simple. 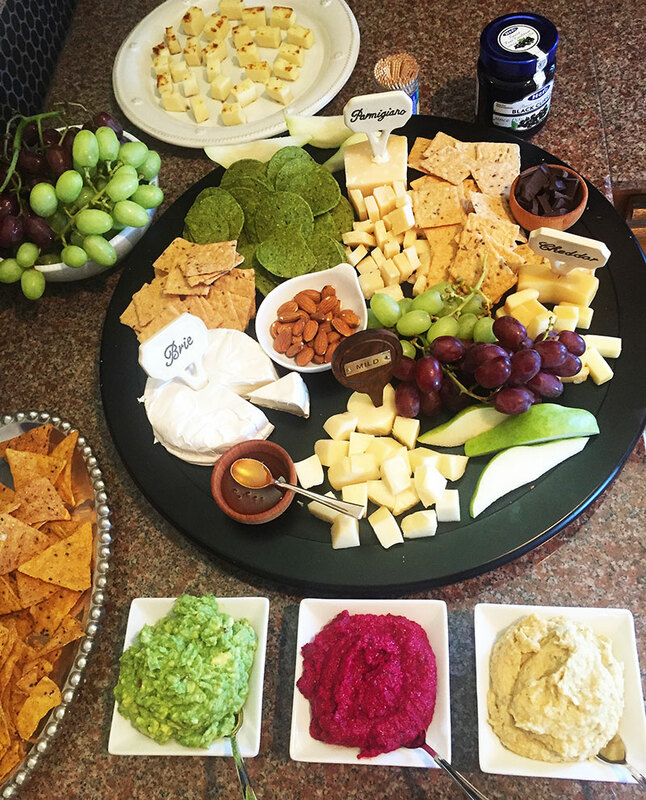 It included bread and crackers, for the hummus, as well as various kinds of cheese. Last but not least, I purchased a flatbread at my local supermarket’s frozen food section, right next to the pizzas. It was easy to bake and my friends thought it was a wonderful addition to the table. I mean, who doesn’t love some freshly baked flatbread with their salad? 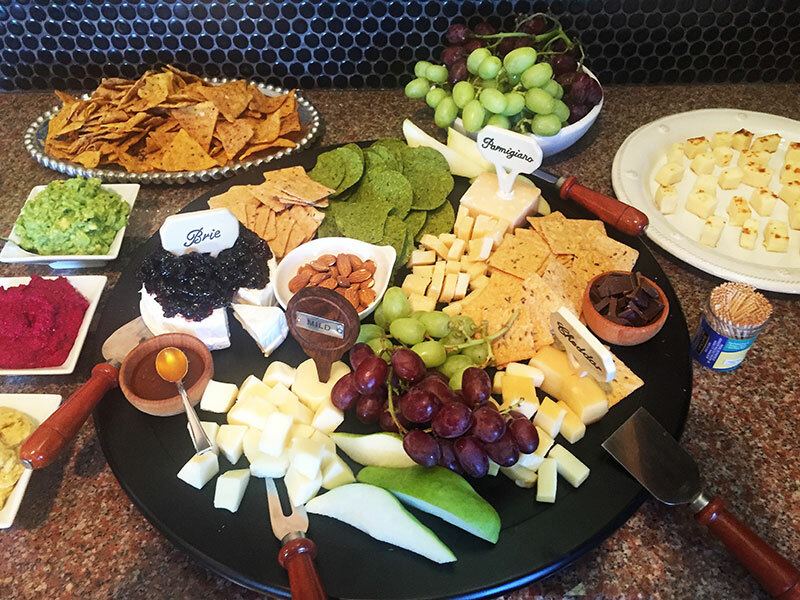 I am obsessed with appetizer platters. I love making them a bit unique and always try to incorporate my own personal twist. We had friends stop by and I wanted to create something that would remind us all of fall. So, I made my three favorite hummus dips … Avocado Hummus, Beet Hummus, and Basil Hummus. Then, I brought in the different cheeses. I included Cheddar, Parmigiano, Brie, and a super neutral mild cheese. I also added some baked cheese, just for fun. I also added some fruit, such as pears and grapes, because they seem to be a favorite among this group of friends. Of course, crackers and chips are also a favorite, not only with the cheese but with the hummus dips. The crackers were all store-bought name brand. Nothing fancy or expensive, since this group of friends had no preference for fancy crackers and to be honest, I think they are a total waste of money. Last but not least, I added some fun elements which my friends may have not expected. A little bit of honey (which is DELICIOUS with the baked cheese) as well as almonds, preserves (for the Brie) and dark chocolate which goes wonderfully with the parmigiana cheese. I love it when I get to be chosen to host a parent coffee. Breakfast is such a fun buffet to prepare, although I’m not always keen on waking up super early to get everything organized. 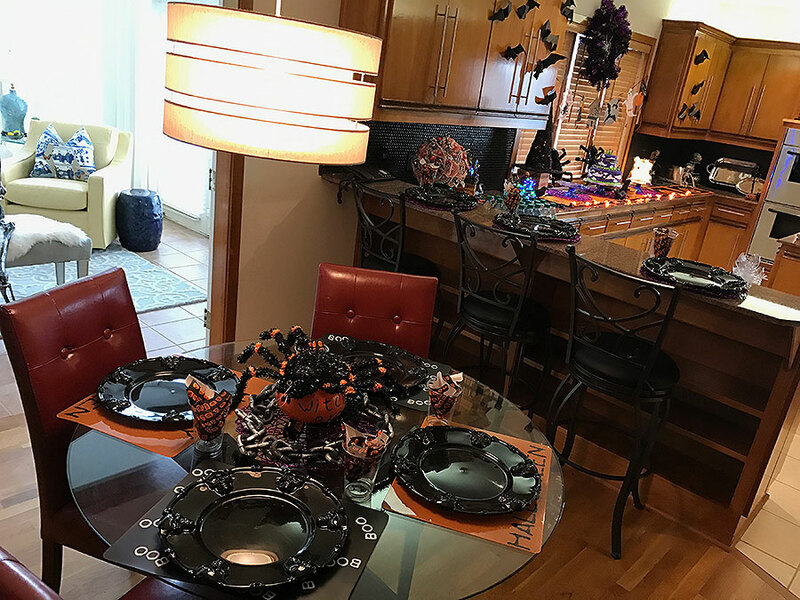 The good news, is if you plan it right, you can have mostly everything prepared the night before and simply lay things out the morning of the party. These photos are from a parent coffee buffet I quickly created. 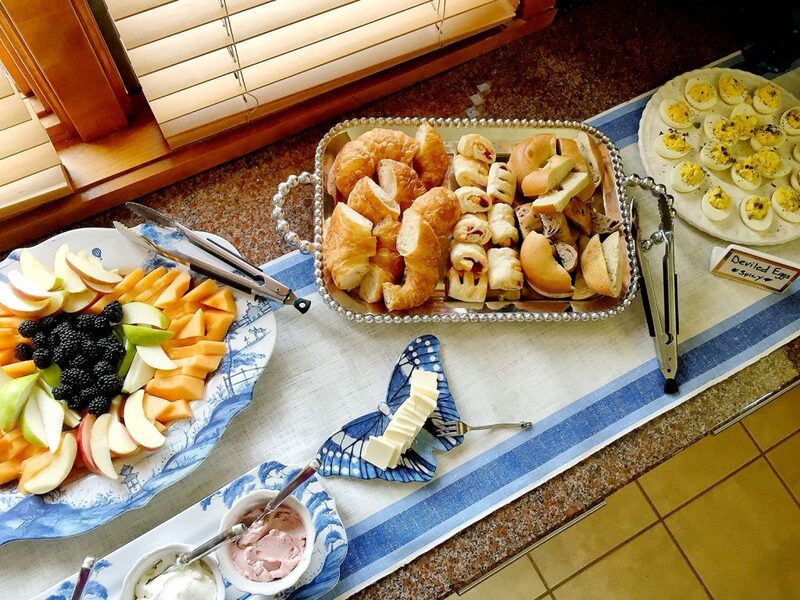 Deviled eggs, bagels, croissants, and fruit. I made the spicy deviled eggs the night before, which is perfect because it gave them a chance to really soak in the flavor. The bagels and pastries were purchased that morning, after I dropped the kids off at school. I had also prepared the butter and cream cheese the night before and stored them covered in the fridge. The simple quiches were made on the morning of. They are super simple to make and best of all, they make the house smell delicious for when the guests arrive. I added the cheese and crackers (because it’s so European and delicious) and as you can tell, they are simply Triscuits and cheddar cheese. Just scooped them out of the packet… nothing too fancy. All in all, the parent coffee was a huge success and I enjoyed putting it together. 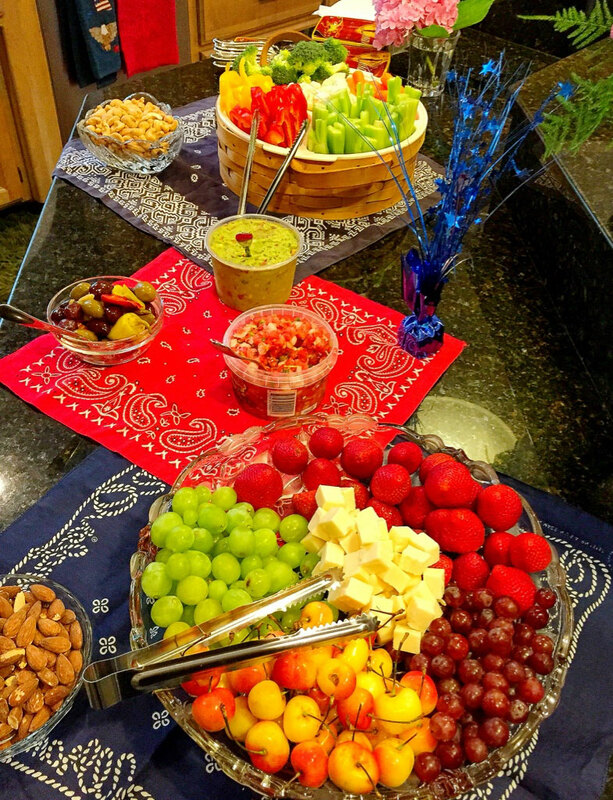 Beautiful patriotic party by my friend, Gina. 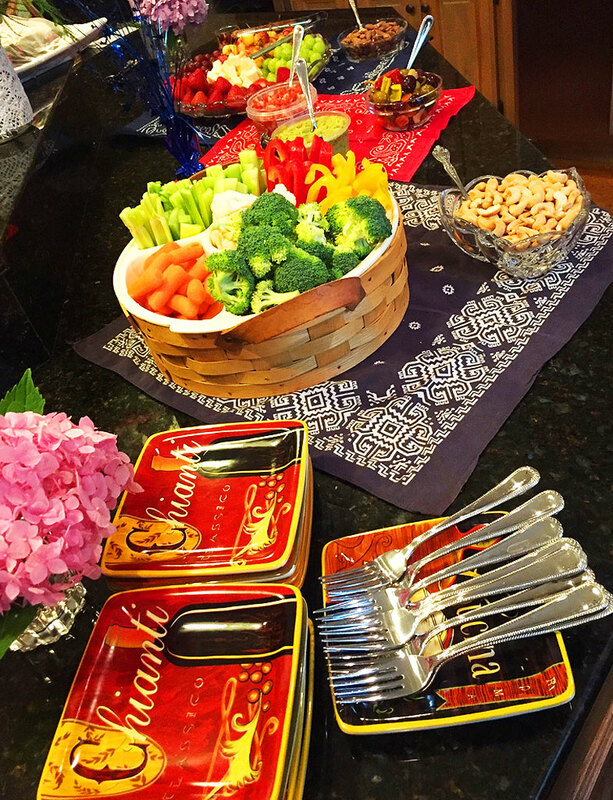 Not long ago, my beautiful friend, Gina, invited me to a creative and patriotic BBQ. 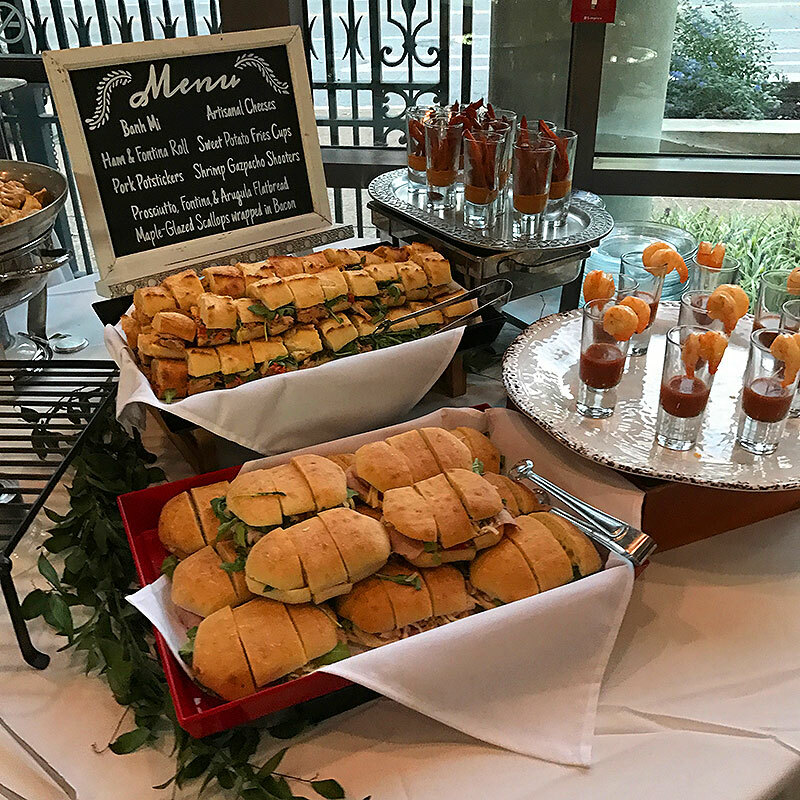 Her family created an unforgettable buffet filled with delicious food and beautifully arranged table. 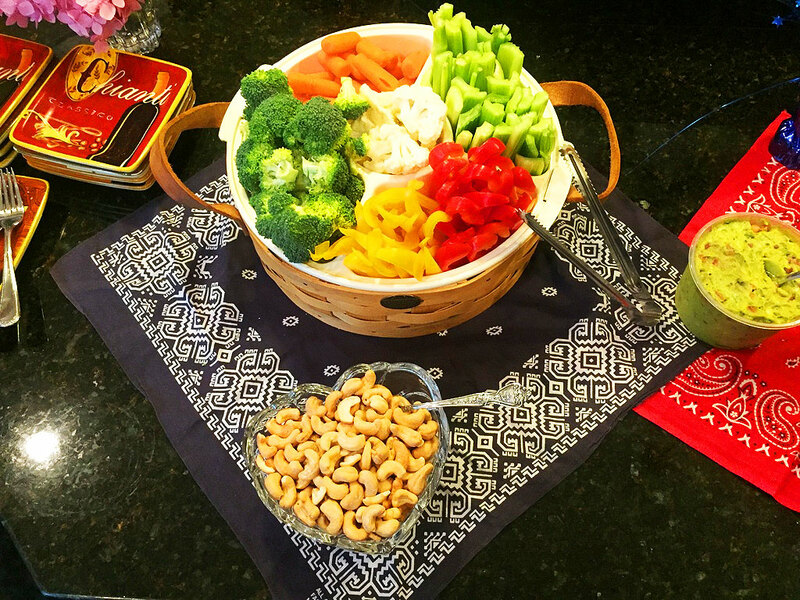 She served fruits, vegetables, chips, dips, nuts, and so much more. It was truly unforgettable. 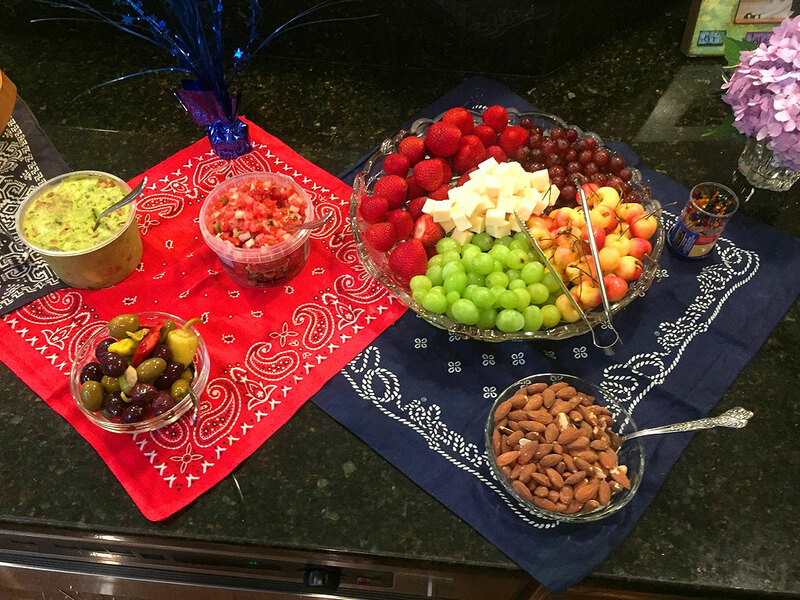 I love how Gina used red, white, and blue bandanas to create a patriotic feel to the party theme. The bandanas served as table runners and had different designs to bring some creative interest. 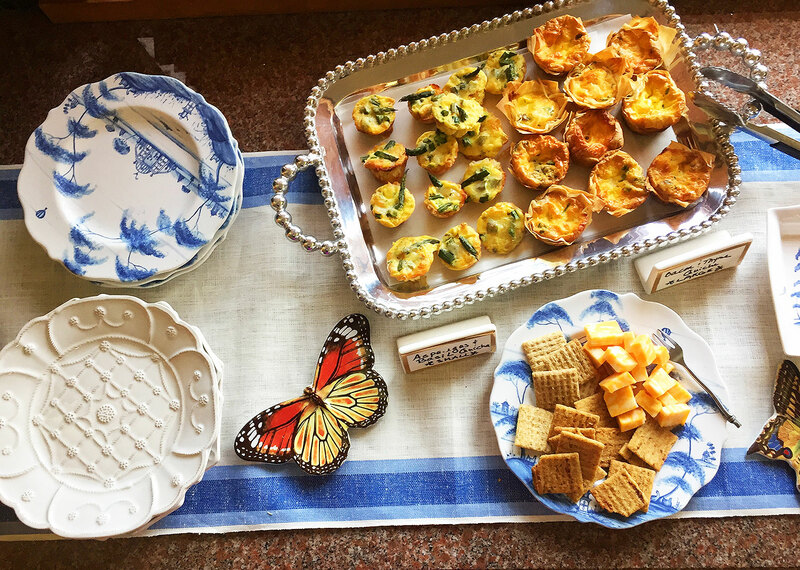 She also used baskets, melamine, crystal, glass, metal, and other dishes to make a fun eclectic look rather than making everything matchy-matchy. 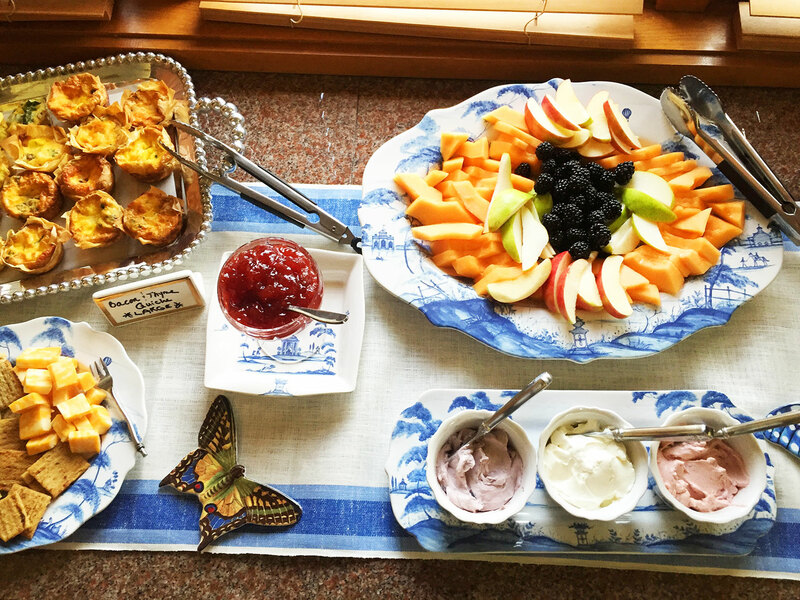 Being able to use all the items you have in a creative way is one of the best skills a hostess can have. Many times, each piece has a story. I like to ask my friends how they came in possession of certain serving pieces. Sometimes they are fun stories with lots of laughs and others are just simple like “I picked it up at Homegoods or Target”. Again, bandanas are used as napkins, tying in the decorations from the buffet. 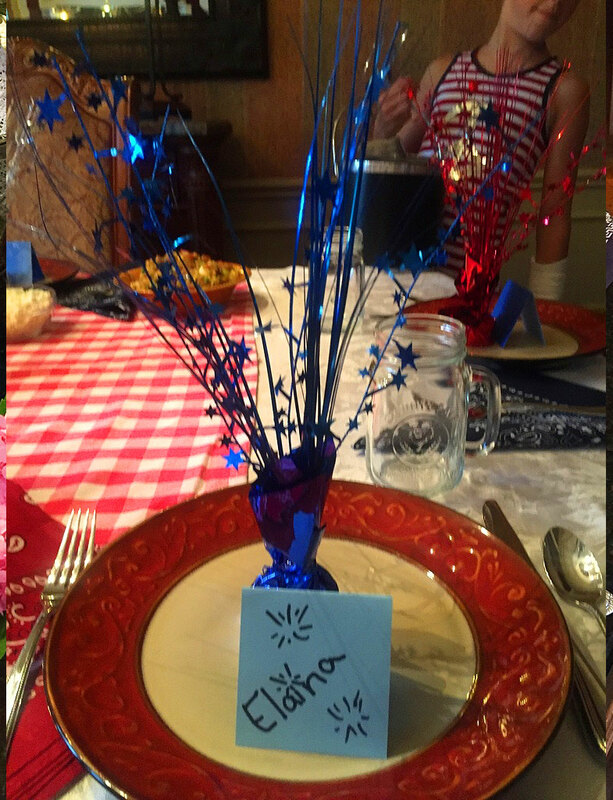 Also, her daughter made the place cards and added little fireworks images to tie in with the props they used as place card holders. Just LOVE the creativity!! Godiva Chocolate Delicious and EASY S’Mores Bar! I forgot to post this oldie but goodie on my blog. 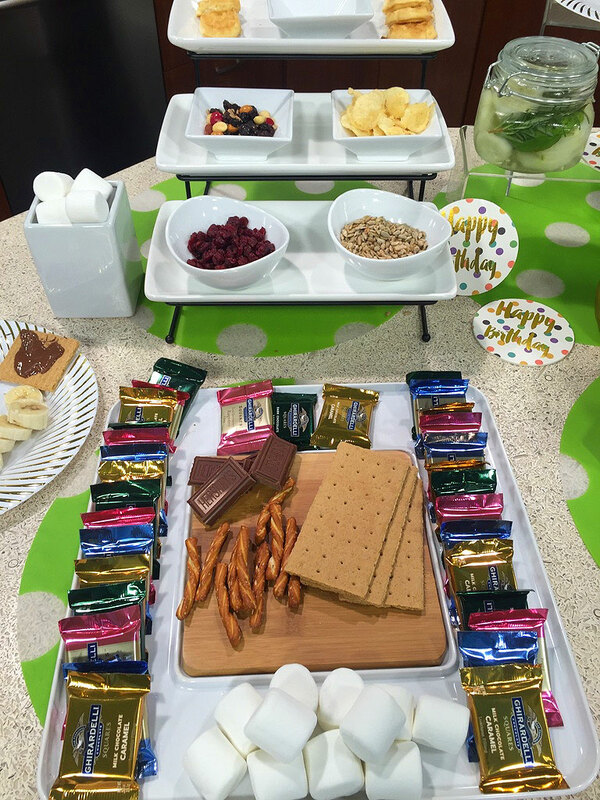 A few years ago I did a fun segment on Better Kansas City on how to create a delicious and easy S’Mores Bar. This idea is super simple and requires very little prep. 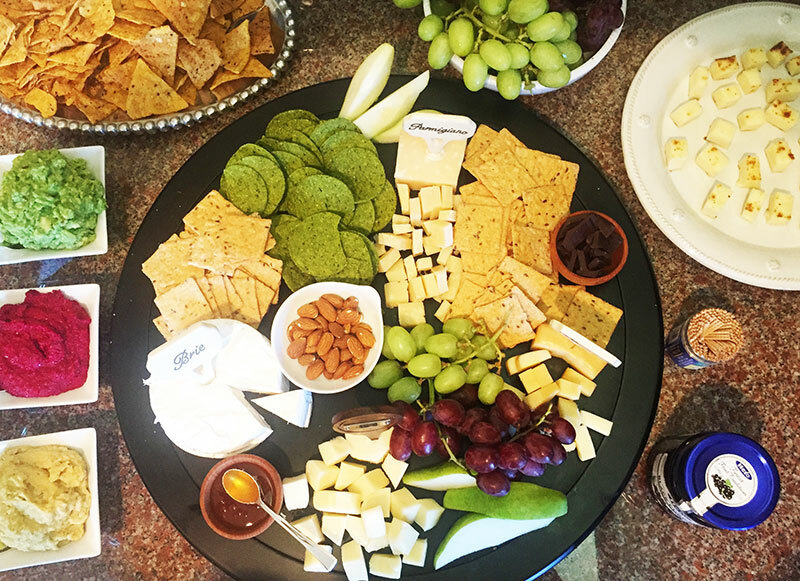 Prior to my party, I created my platter with the Godiva Chocolate Squares. 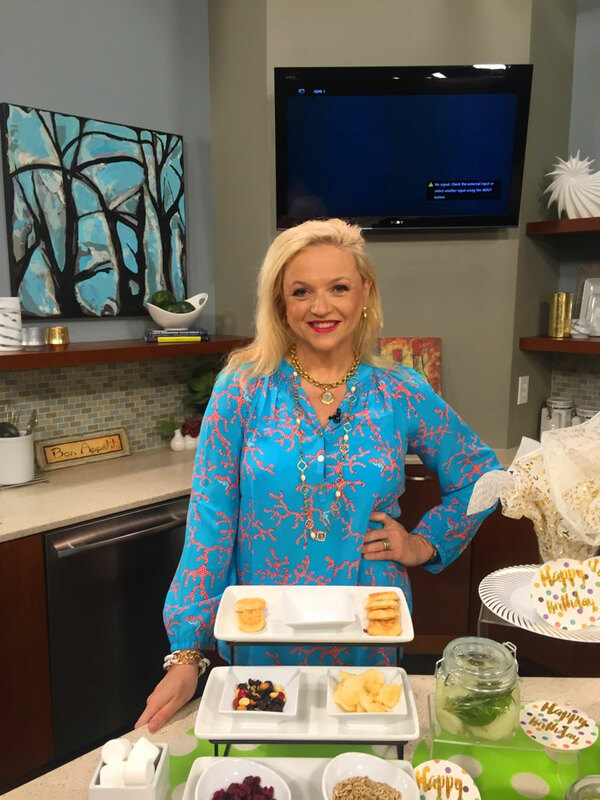 Then, for the “extras”, I just prepared some sandwich bags filled with the ingredients I wanted to include inside my S’Mores and when it was time to serve, I just quickly put them into white plates and Voila…. DONE!! We used stereos for our fire source inside the house. Here’s a beautiful Godiva S’Mores Platter. Includes Godiva chocolates, graham crackers, pretzel sticks, marshmallows and more!